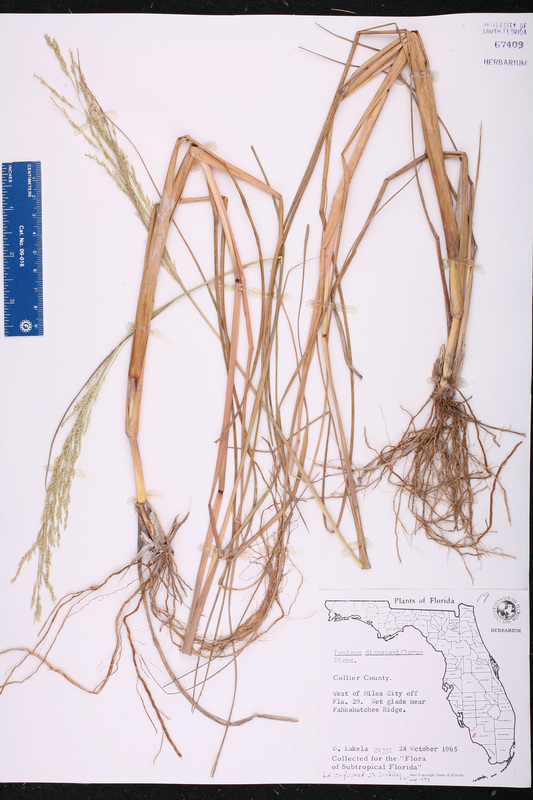 Citation PANICUM DICHOTOMIFLORUM Michaux, Fl. Bor.-Amer. 1: 48. 1803. 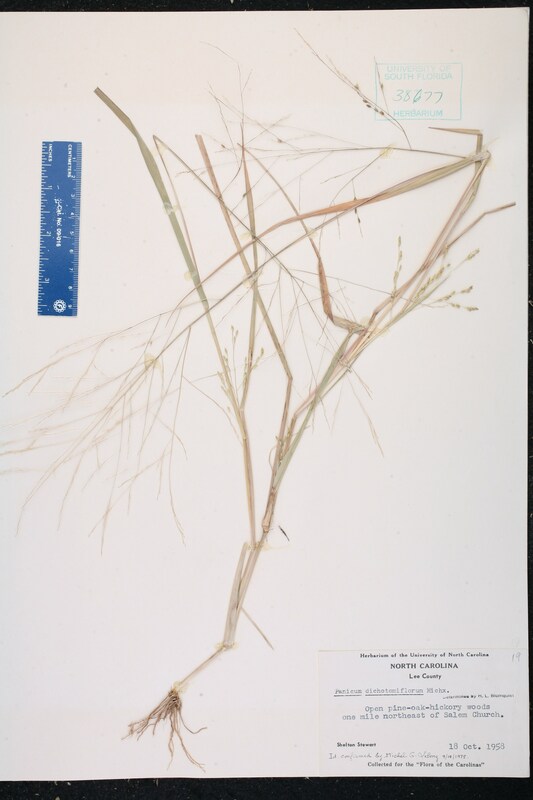 Type: "Occidentalibus montium Alleghanis", without data, Michaux s.n. 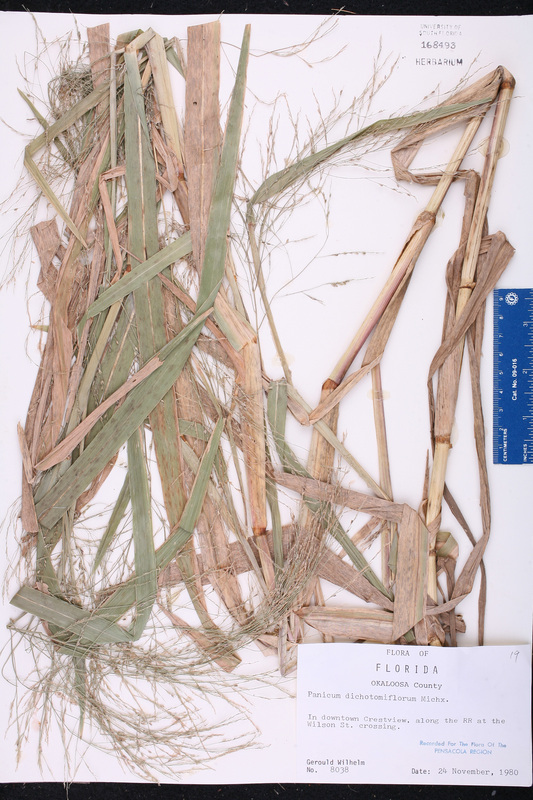 (lectotype: P-M). Lectotypified by Hitchcock & Chase, Contr. U.S. Natl. Herb. 15: 48. 1910. Leptoloma dichotomiflora Leptoloma dichotomiflora (Michaux) Smyth, Tran. 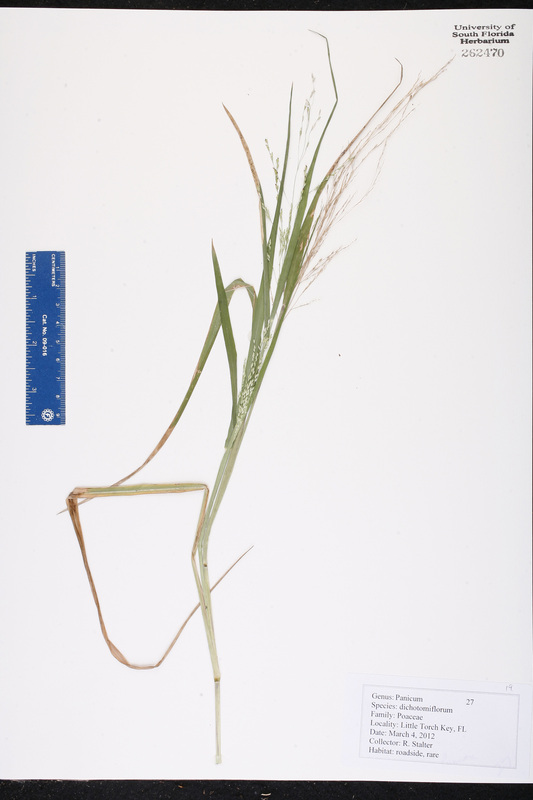 Kansas Acad. Sci. 25: 86. 1913. 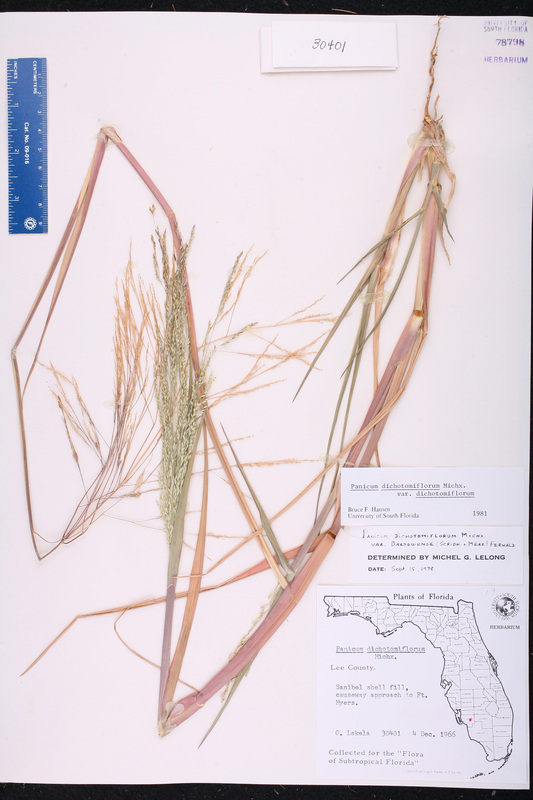 BASIONYM: Panicum dichotomiflorum Michaux 1803. 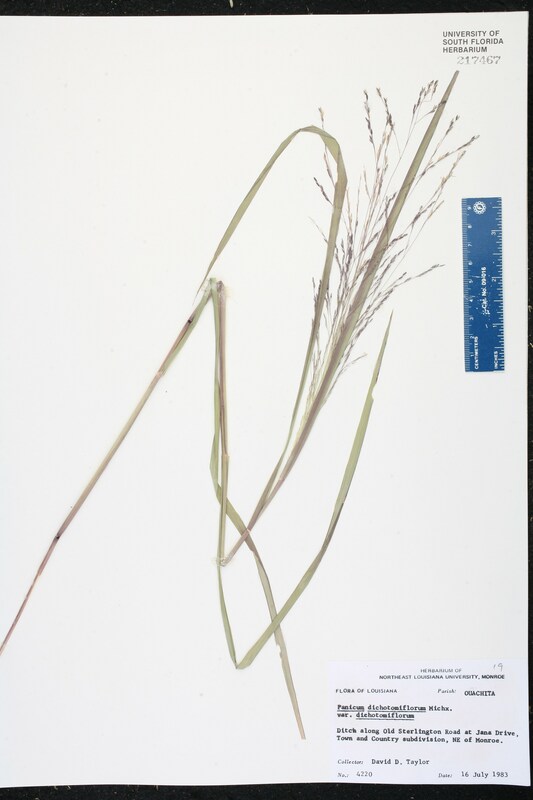 Panicum amplectans Panicum amplectans Chapman, Bot. Gaz. 3: 20. 1878. 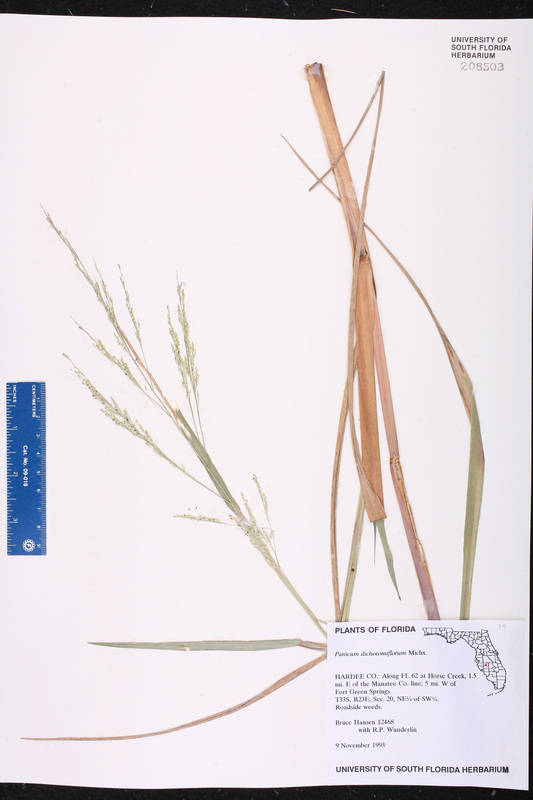 TYPE: FLORIDA: "South Florida", Blodgett s.n. 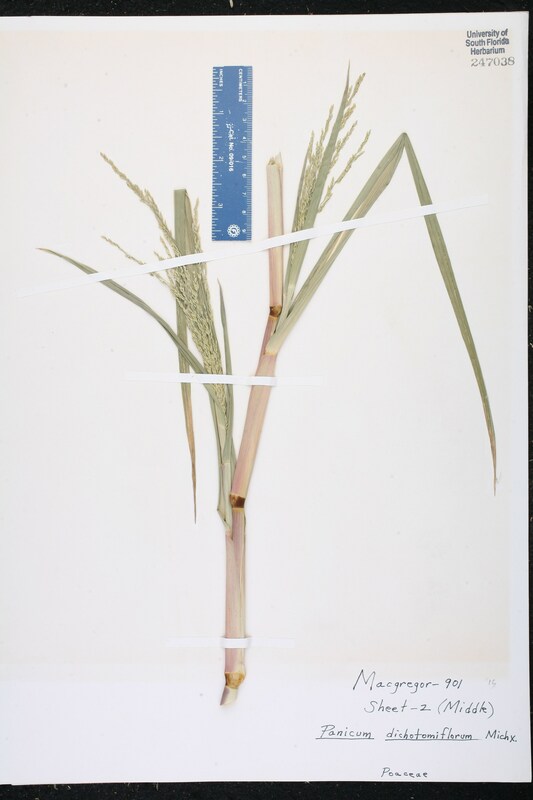 (holotype: US). 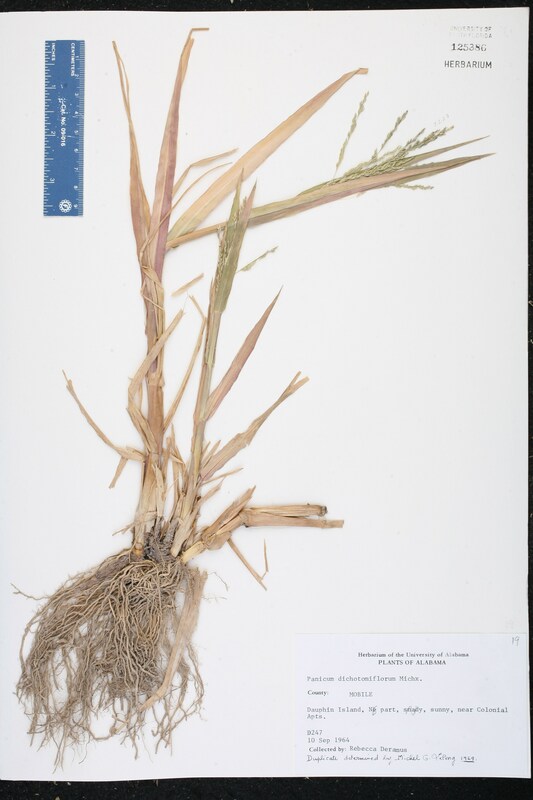 Panicum brachiatum Panicum brachiatum Bosc ex Sprengel, Syst. Veg. 1: 321. 1824 ("1825"), non Poiret 1816. TYPE: "Ins. Bermud." 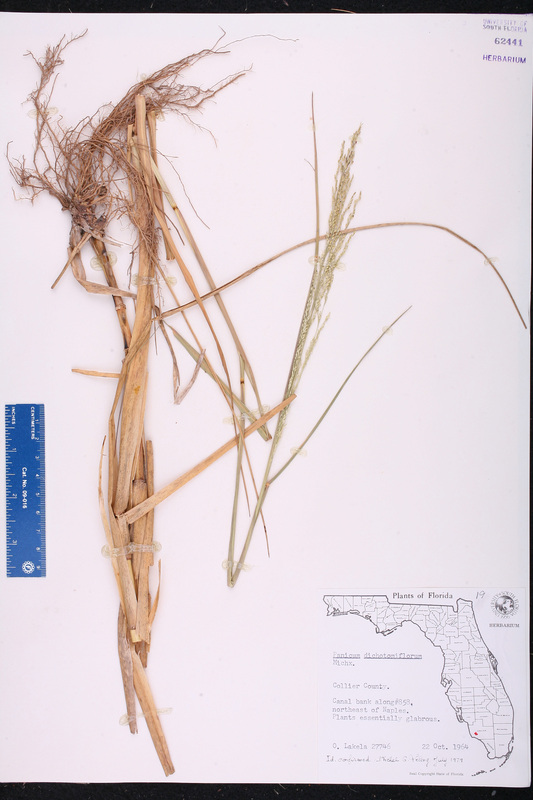 [however, Bosc collections are all from the Carolinas], without data, Bosc s.n. 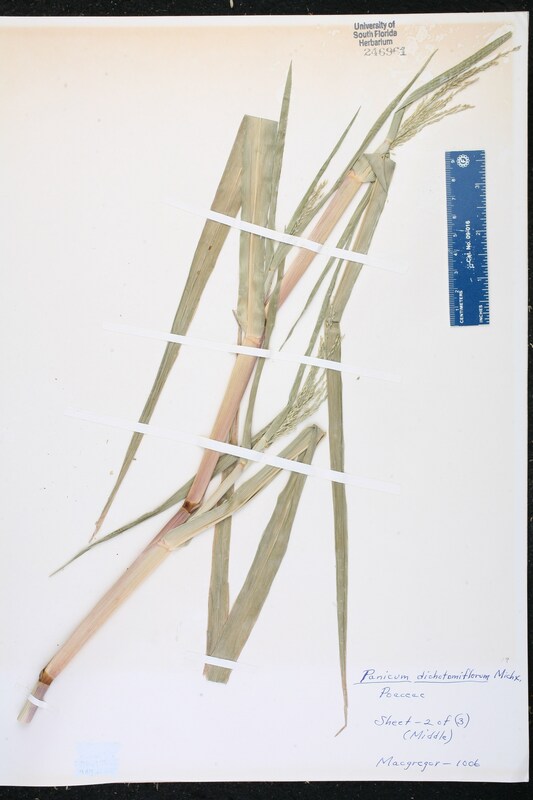 (holotype: P?). 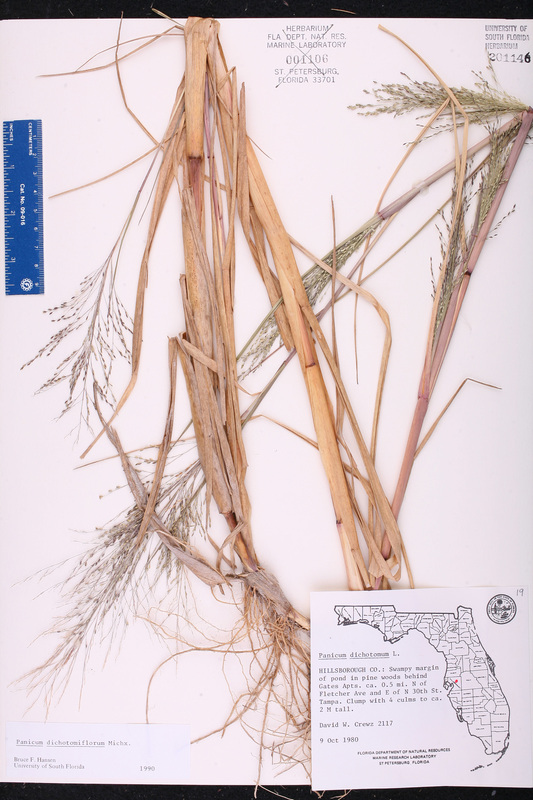 Panicum geniculatum Panicum geniculatum Muhlenberg, Cat. Pl. 9. 1813, nom. illegit. 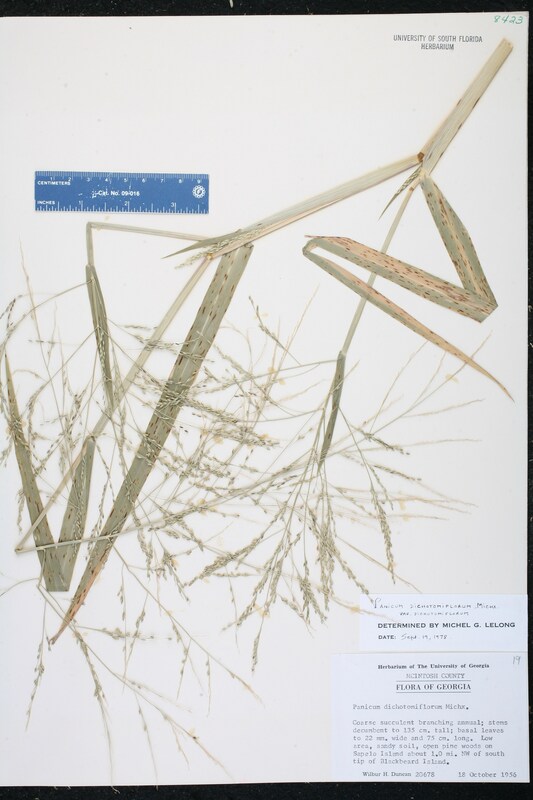 et non Lamarck 1798. 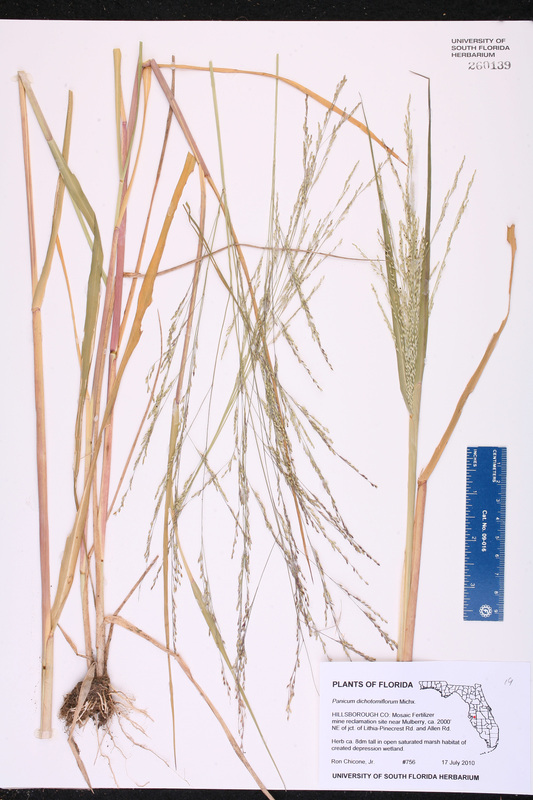 BASIONYM: Panicum dichotomiflorum Michaux 1803. 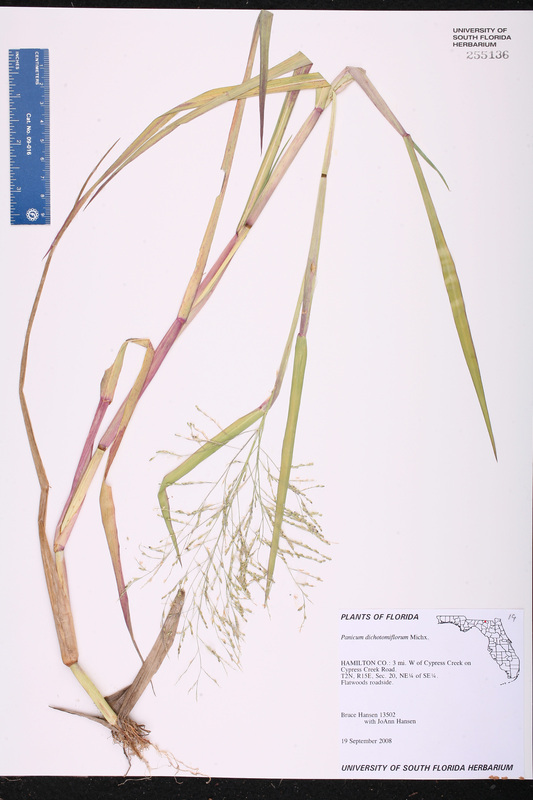 Panicum proliferum var. 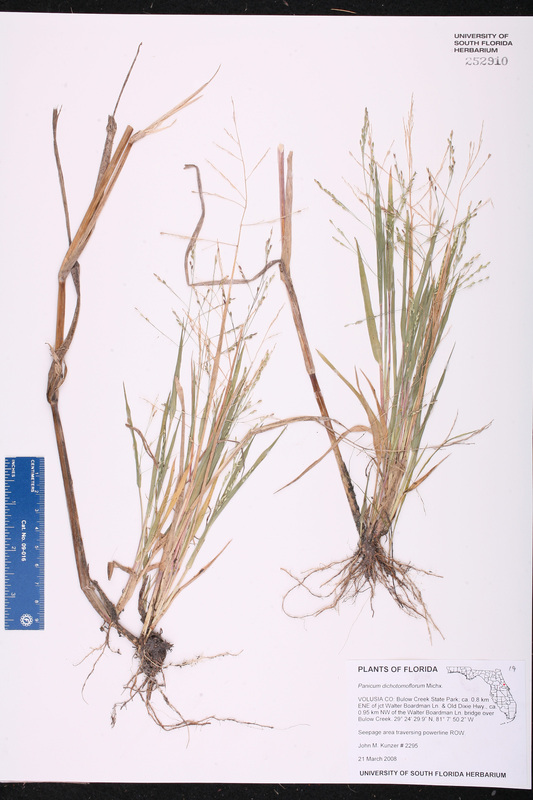 geniculatum Panicum proliferum Lamarck, var. 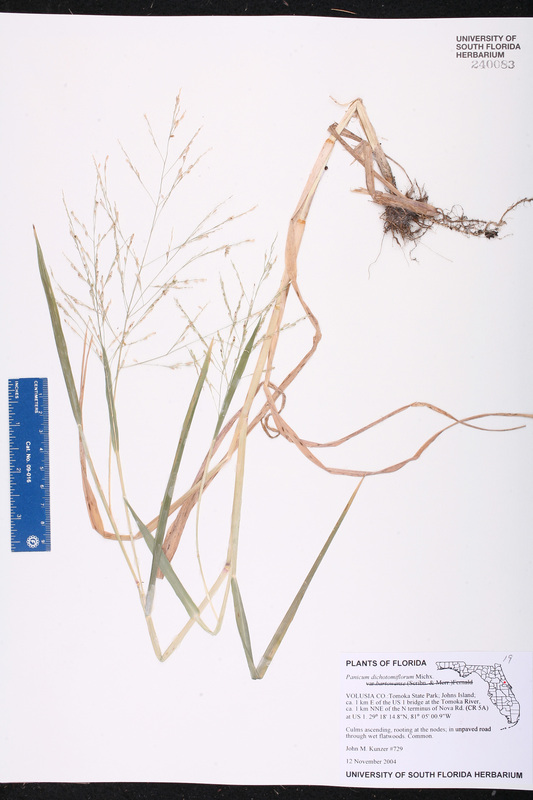 geniculatum Vasey, Grasses U.S. 12. 1883, non A. W. Wood 1871. 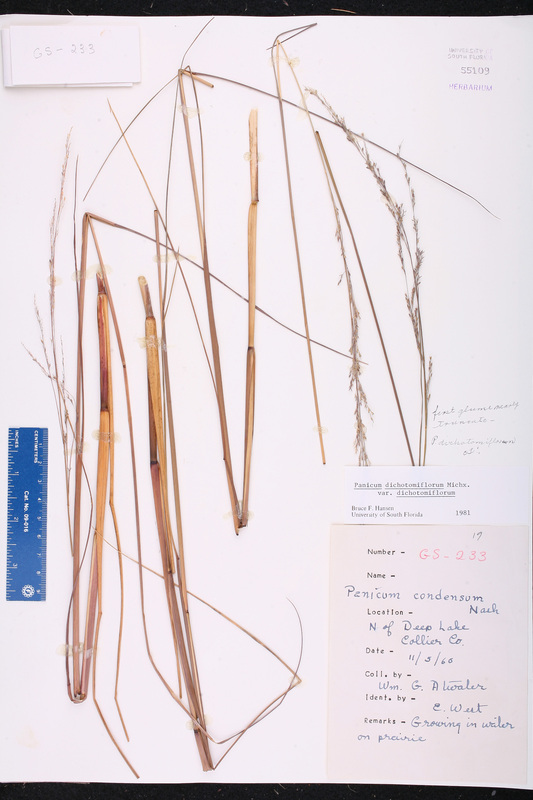 BASIONYM: Panicum geniculatum Muhlenberg 1813, nom. illegit. 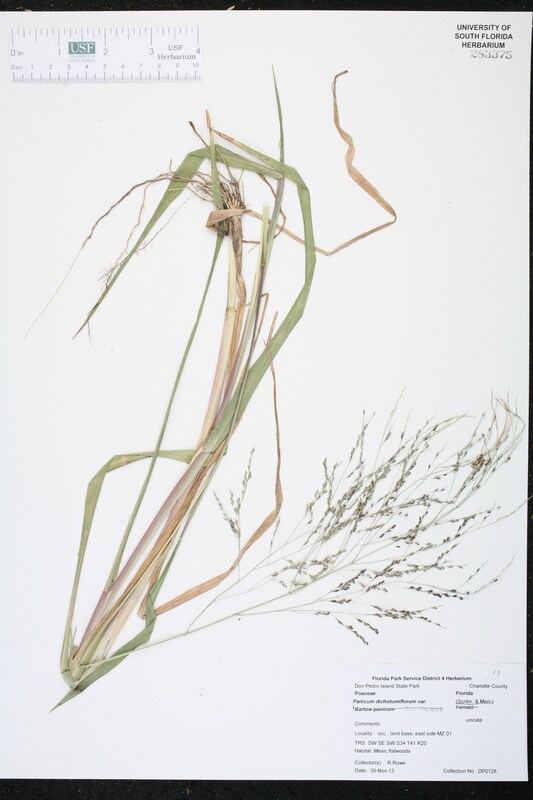 et non Lamarck 1798; Panicum dichotomiflorum Michaux 1803. 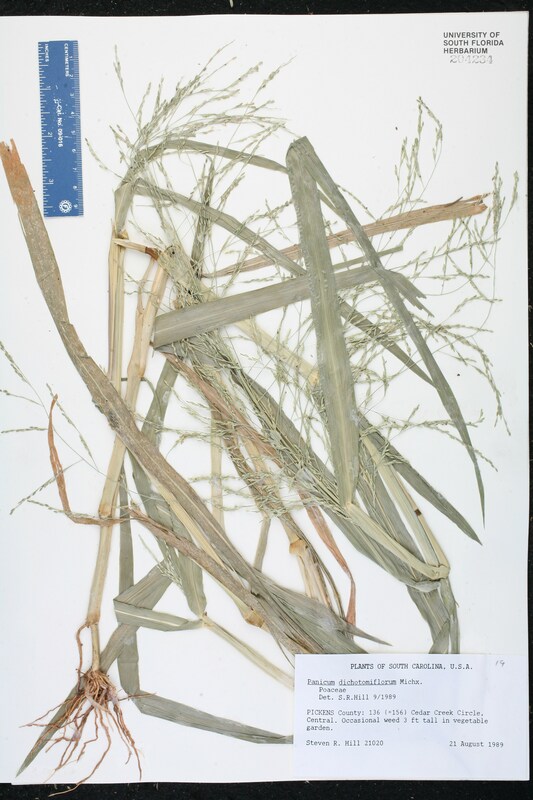 Panicum retrofractum Panicum retrofractum Delile ex Desvaux, Opusc. Sci. Phys. Nat. 96. 1831. 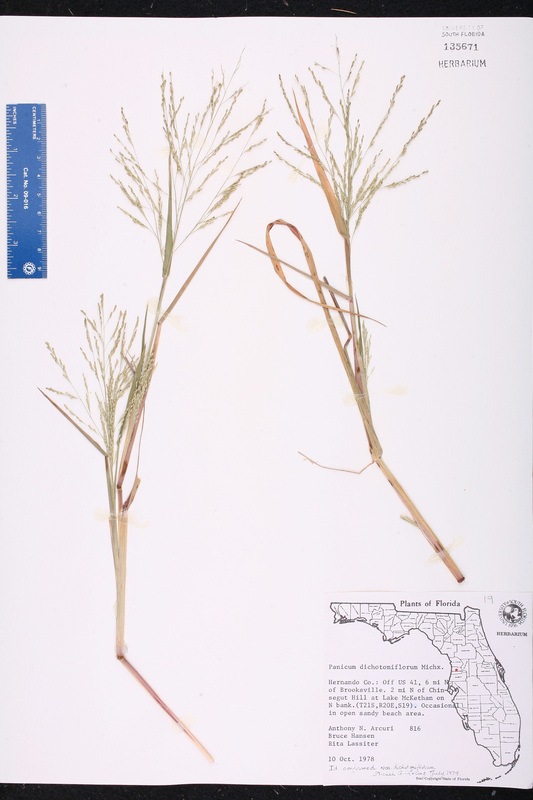 TYPE: "Caroline", without data (holotype: P). 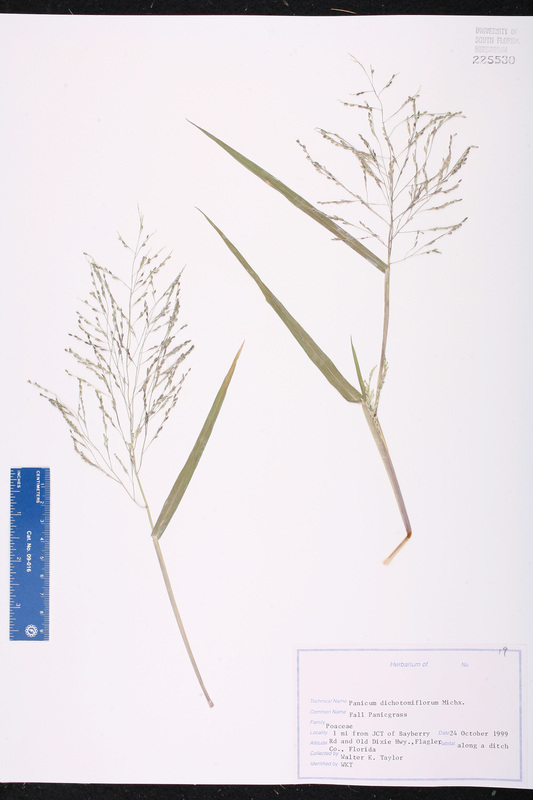 Panicum aquaticum var. 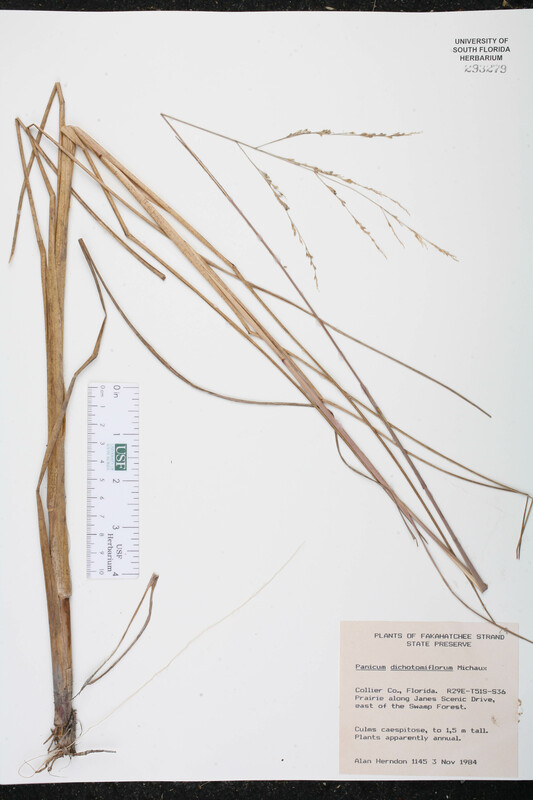 chloroticum Panicum aquaticum Poiret, var. 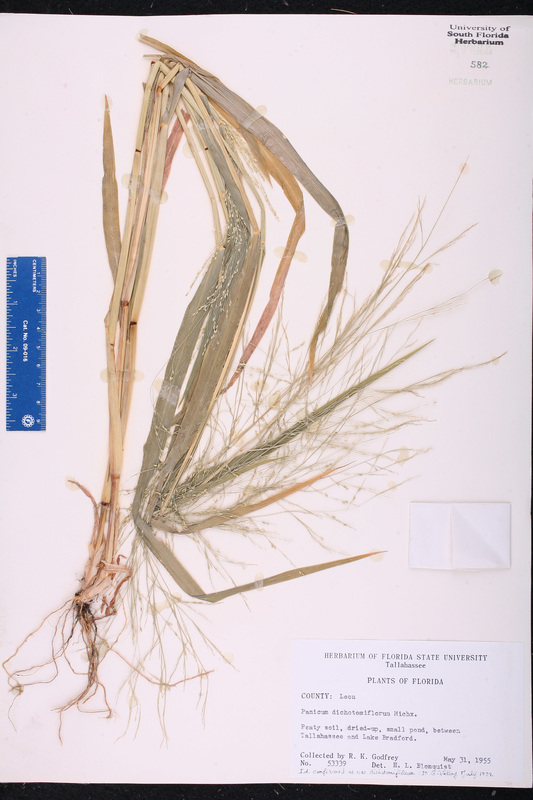 chloroticum (Nees von Esenbeck ex Trinius) R. C. Foster, Rhodora 68: 320. 1966. 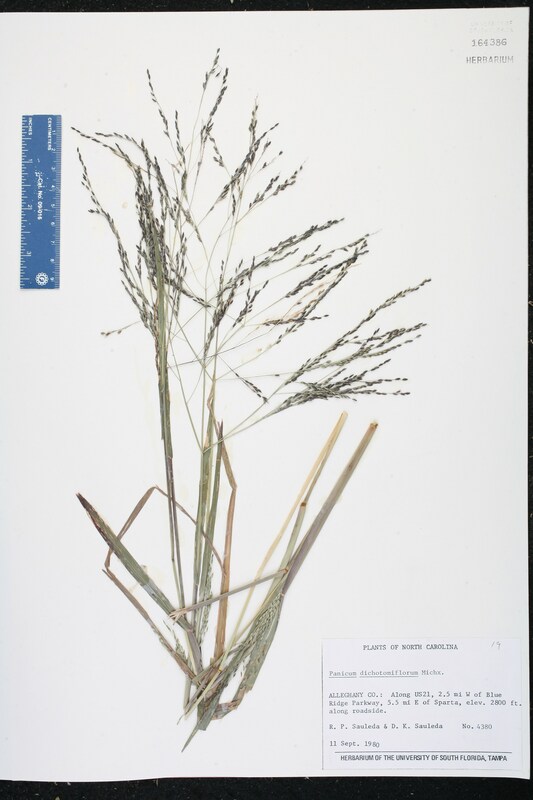 BASIONYM: Panicum chloroticum Nees von Esenbeck ex Trinius 1826. 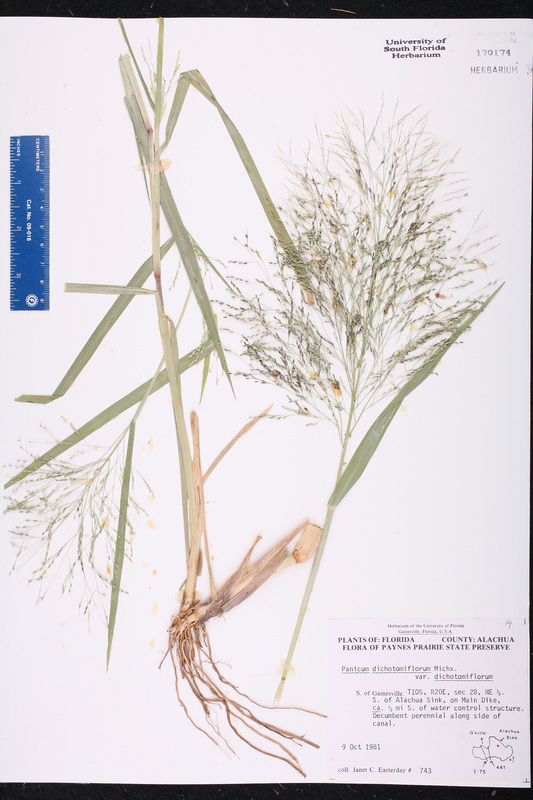 Panicum chloroticum Panicum chloroticum Nees von Esenbeck ex Trinius, Gram. Panic. 236. 1826. 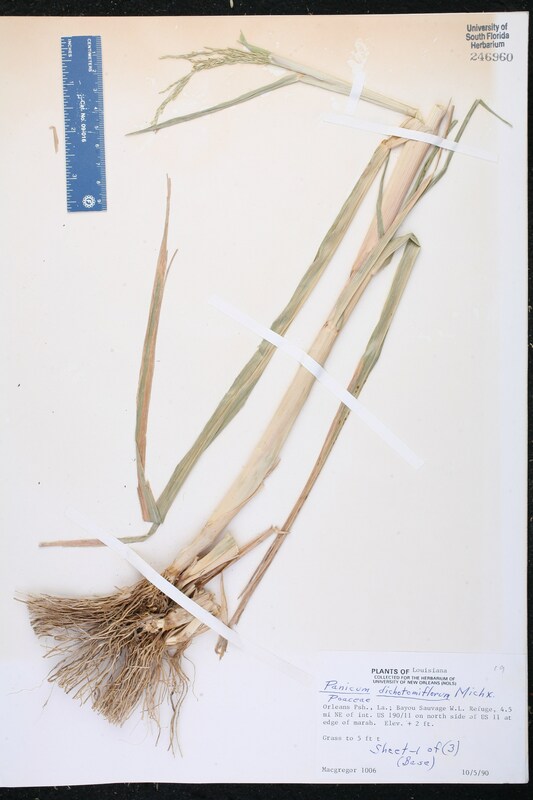 TYPE: BRAZIL: Mato Grosso: Cuiaba, Rio Paraguay, 1829, Langsdorff s.n. 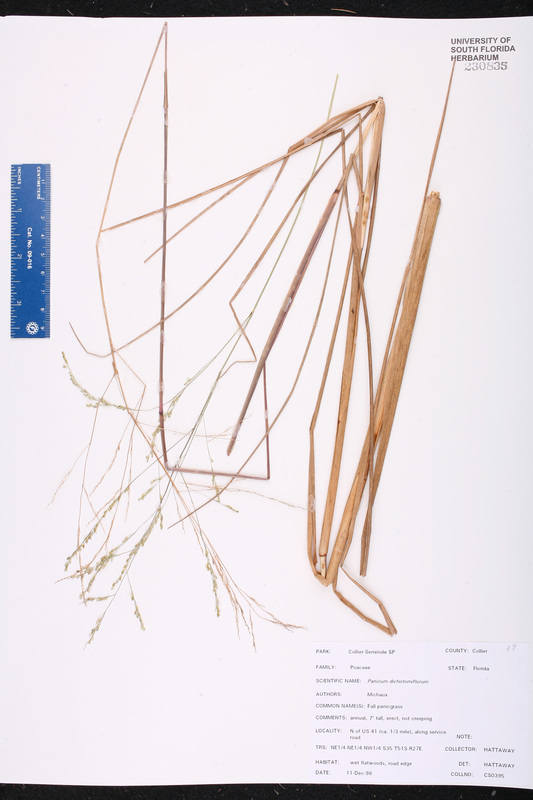 (holotype: LE). 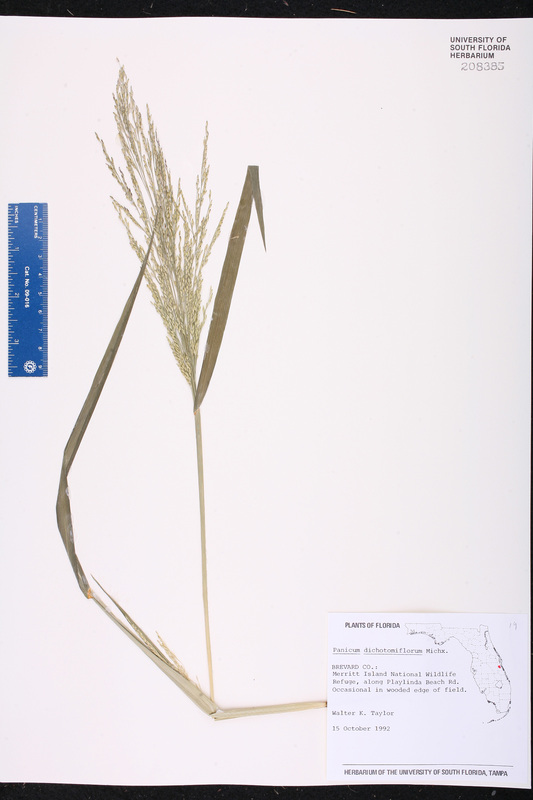 Panicum chloroticum Panicum chloroticum Nees von Esenbeck ex Trinius, var. 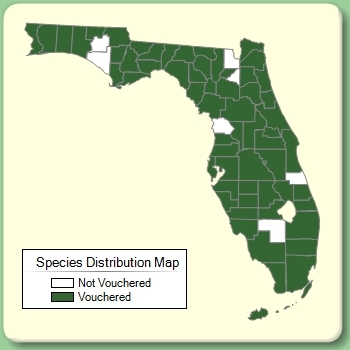 luxurians Döll, in Martius, Fl. Bras. 2(2): 198. 1877, nom. illegit. 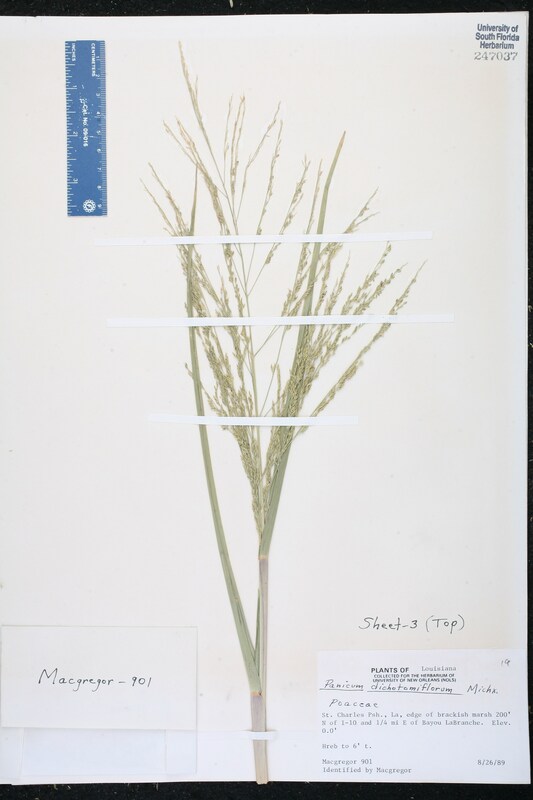 BASIONYM: Panicum chloroticum Nees von Esenbeck ex Trinius, var. pingue Nees von Esenbeck 1829. 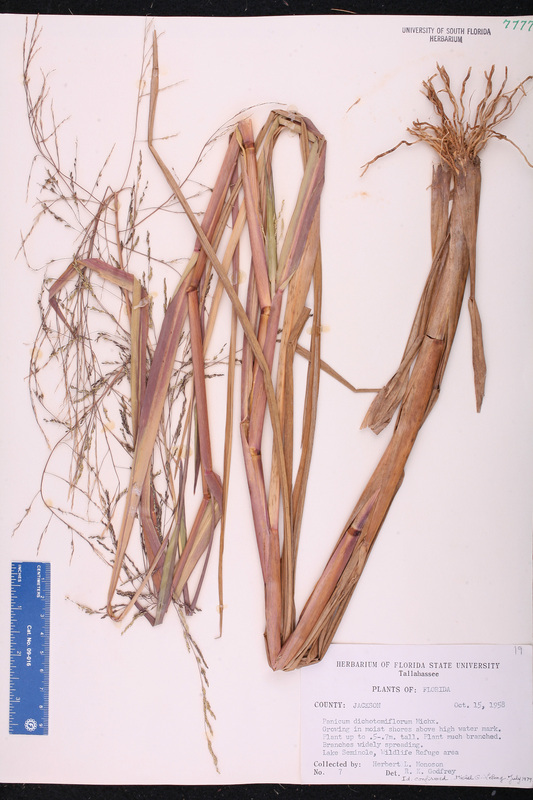 Panicum chloroticum var. 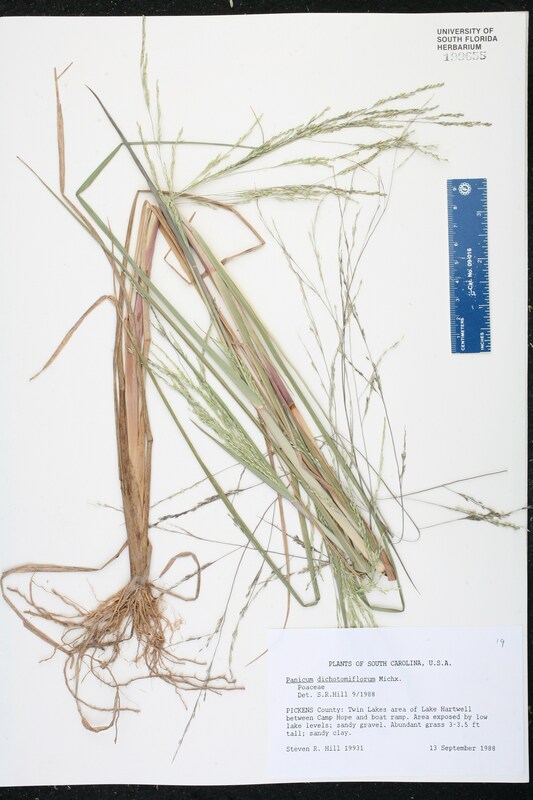 agreste Panicum chloroticum Nees von Esenbeck ex Trinius, var. 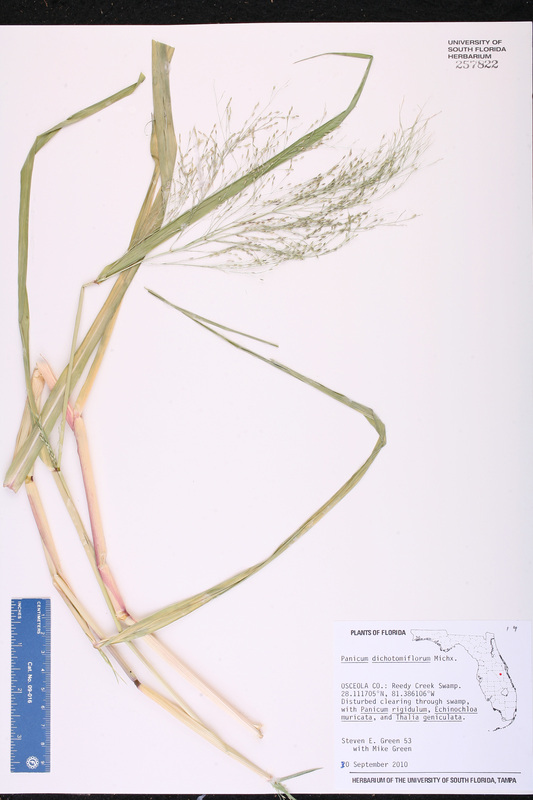 agreste Nees von Esenbeck ex Trinius, Gram. Panic. 236. 1826, nom. inadmiss. 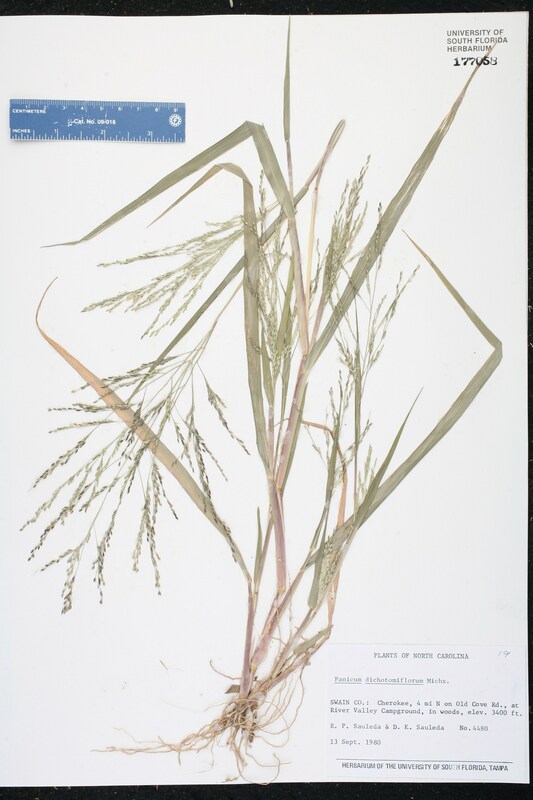 BASIONYM: Panicum chloroticum Nees von Esenbeck ex Trinius 1826. 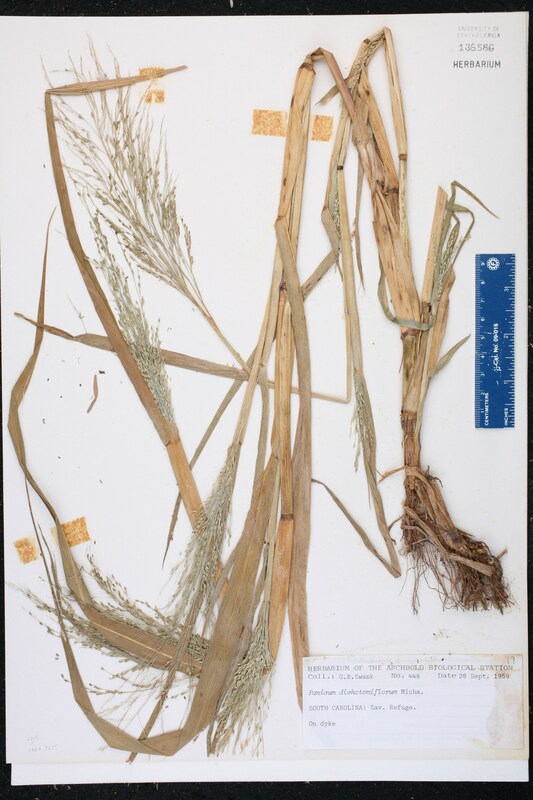 Panicum dichotomiflorum subsp. 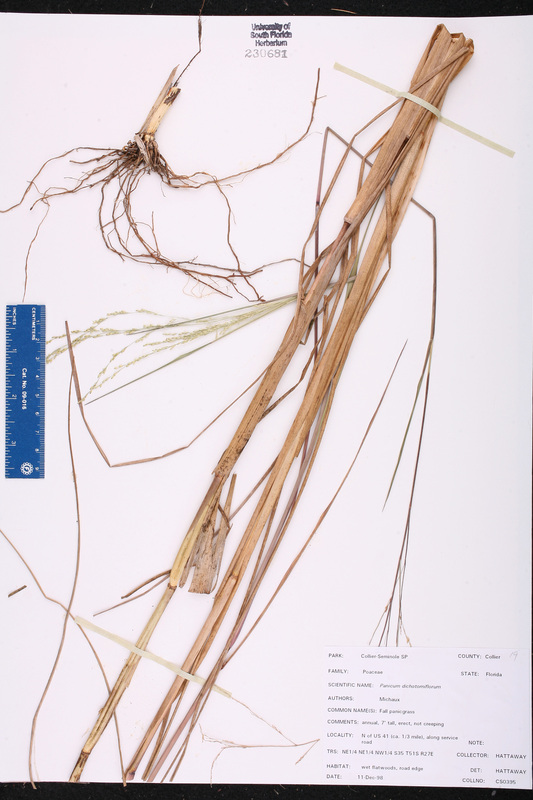 puritanorum Panicum dichotomiflorum Michaux, subsp. 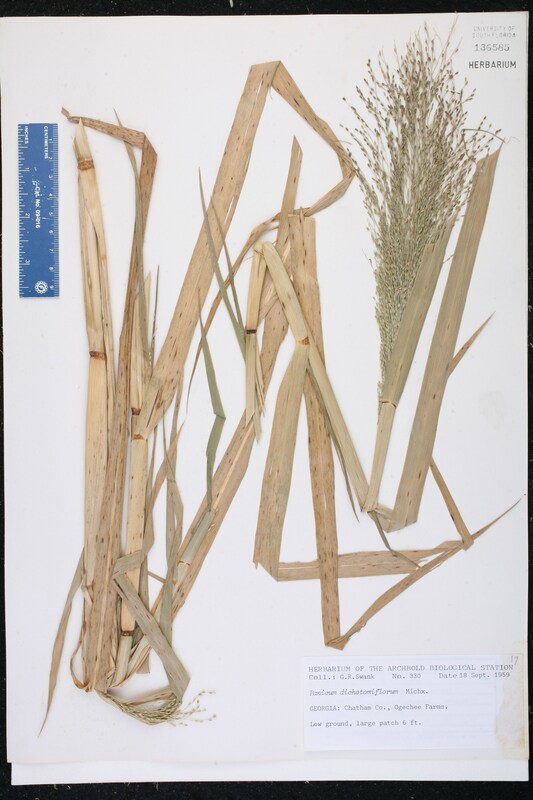 puritanorum (Svenson) Freckmann & Lelong, Sida 20: 171. 2002. 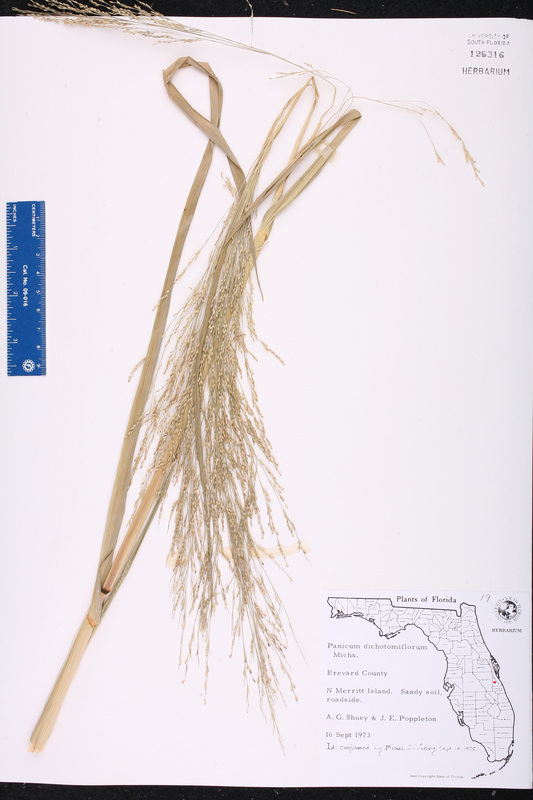 BASIONYM: Panicum dichotomiflorum Michaux, var. puritanorum Svenson 1920. 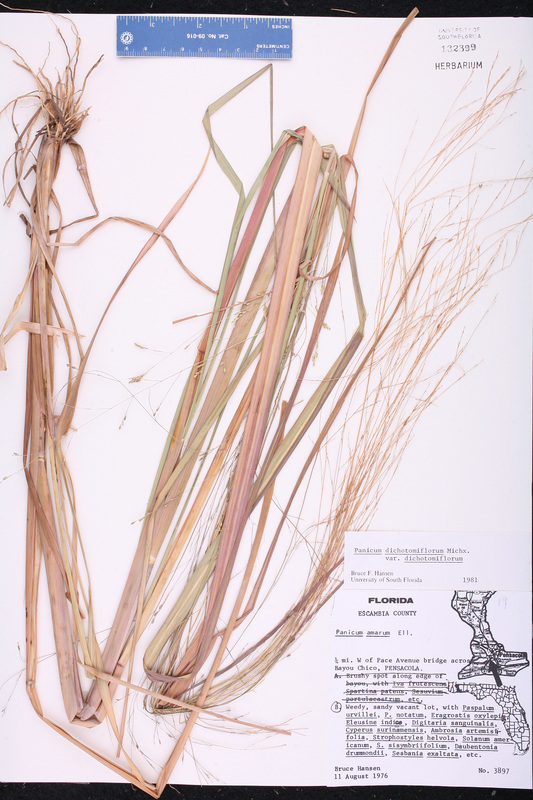 Panicum dichotomiflorum var. 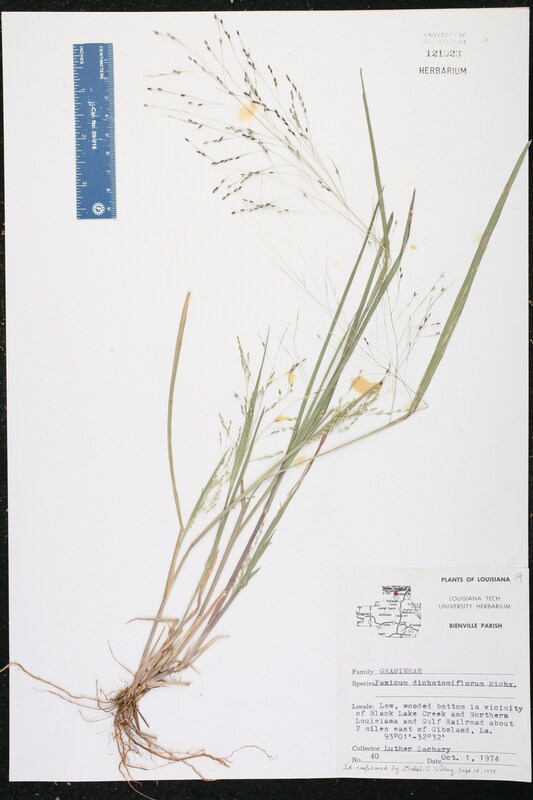 geniculatum Panicum dichotomiflorum Michaux, var. 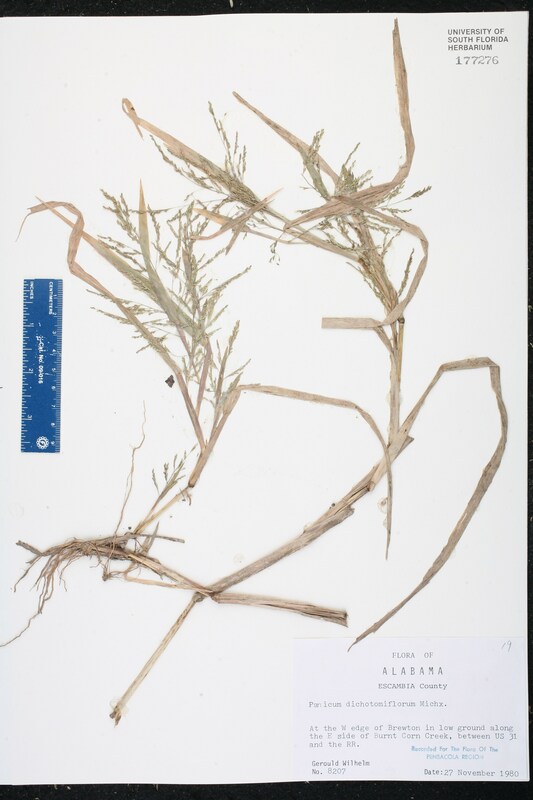 geniculatum (A. W. Wood) Fernald, Rhodora 38: 387. 1936. 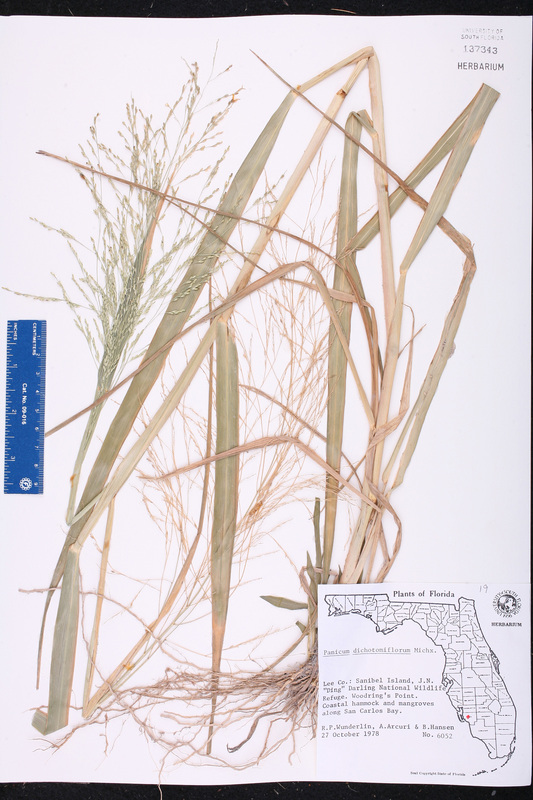 BASIONYM: Panicum proliferum Lamarck, var. 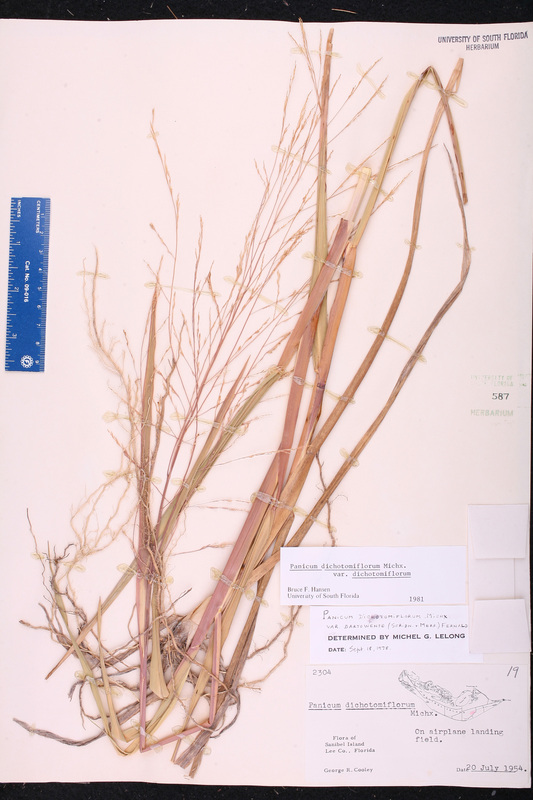 geniculatum A. W. Wood 1871. 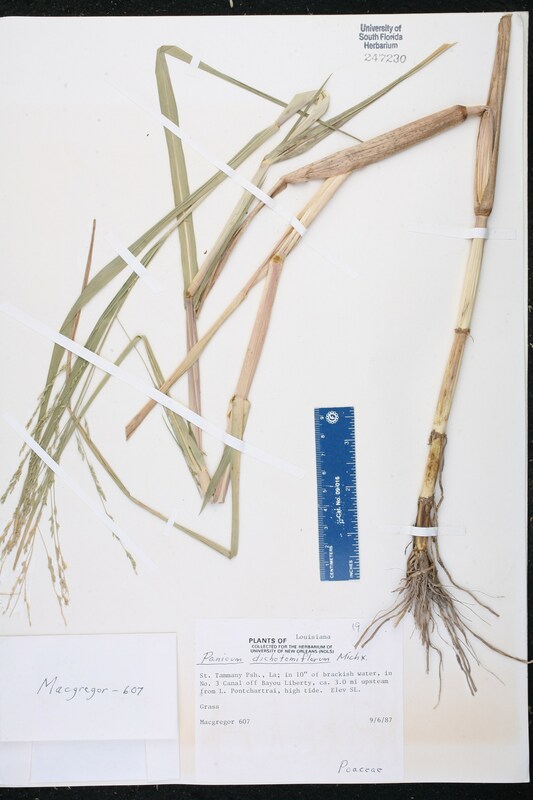 Panicum dichotomiflorum var. 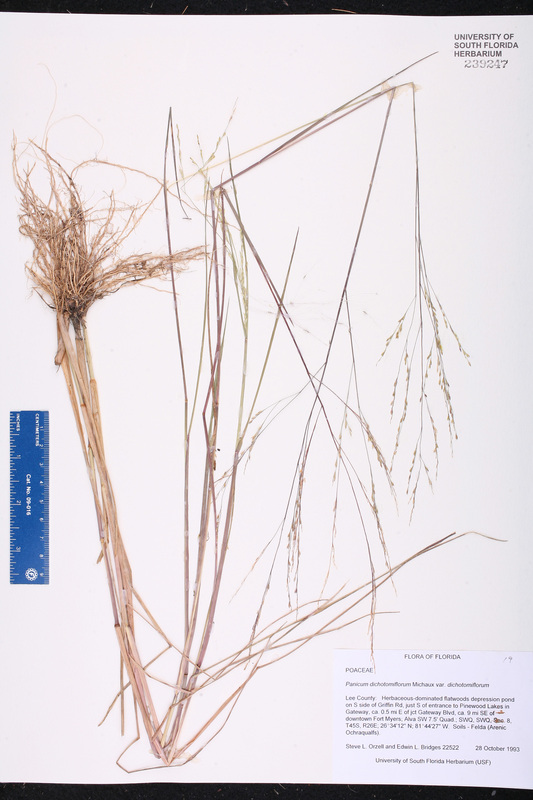 imperiorum Panicum dichotomiflorum Michaux, var. 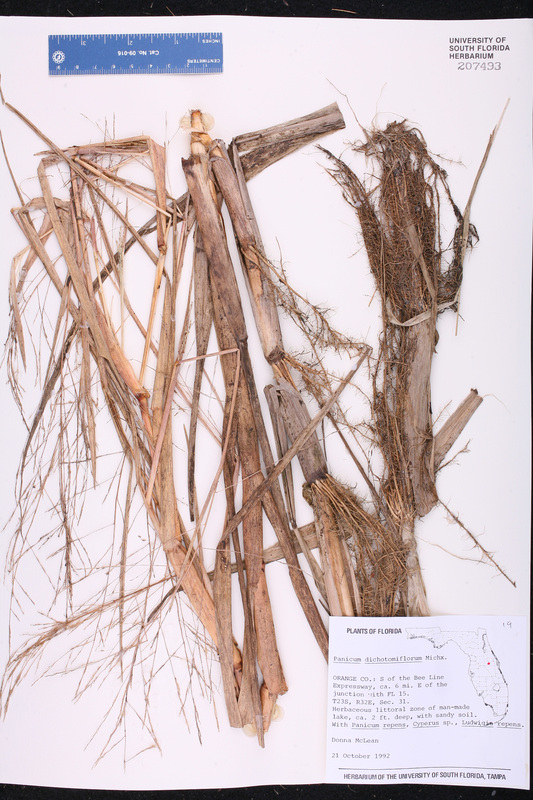 imperiorum Fernald, Rhodora 44: 380. 1942. 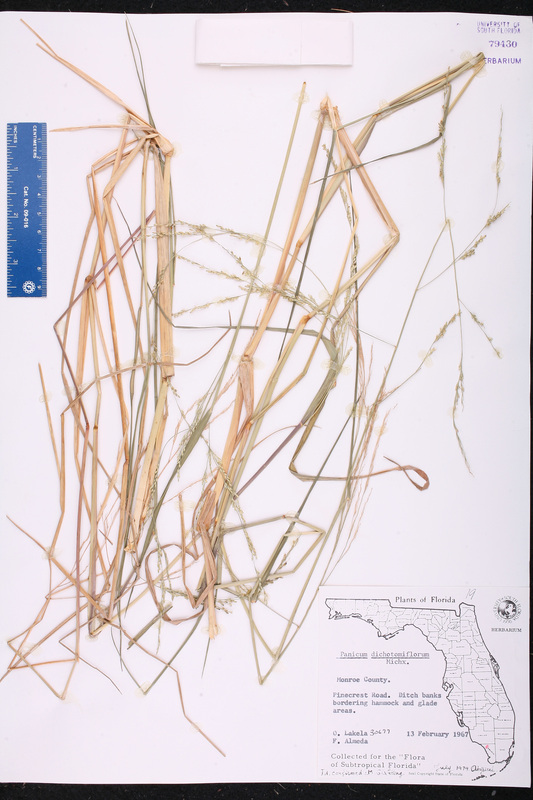 TYPE: VIRGINIA: Greensville Co.: Fontaine Creek, SW of Haley's Bridge, 14 Oct 1941, Fernald & Long 13877 (holotype: GH; isotype: PH). 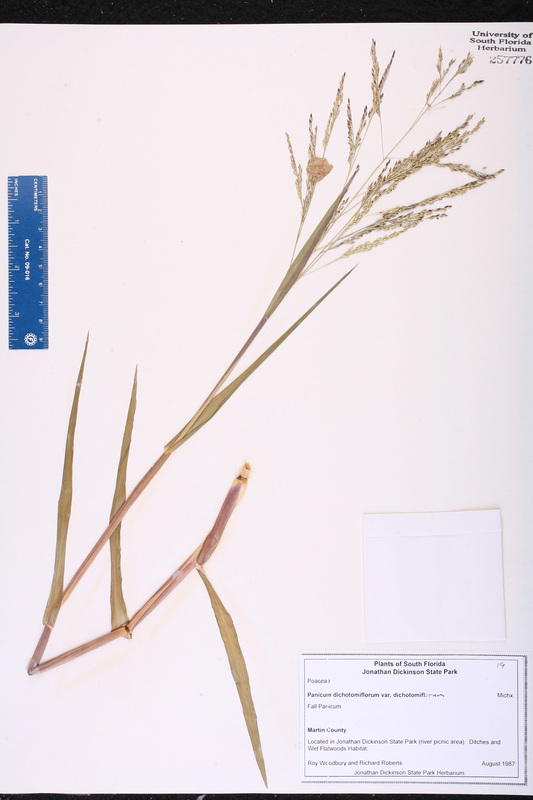 Panicum dichotomiflorum var. 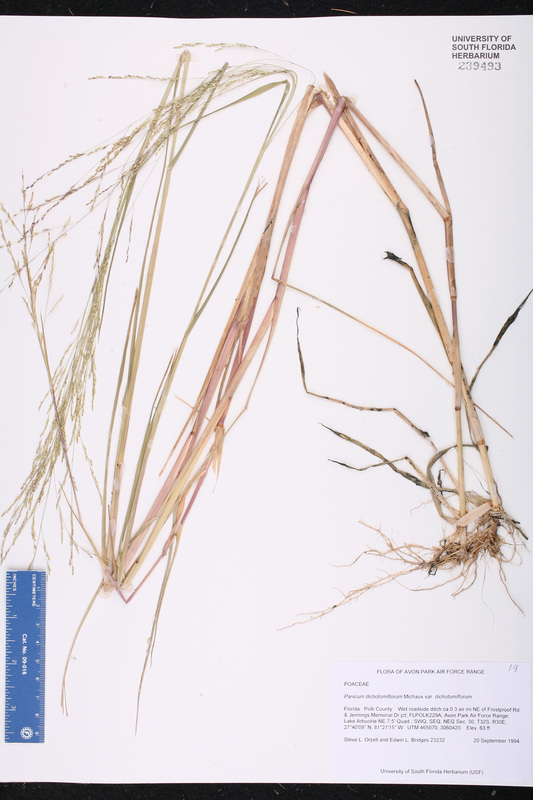 puritanorum Panicum dichotomiflorum Michaux, var. puritanorum Svenson, Rhodora 22: 154, f. 1-4. 1920. 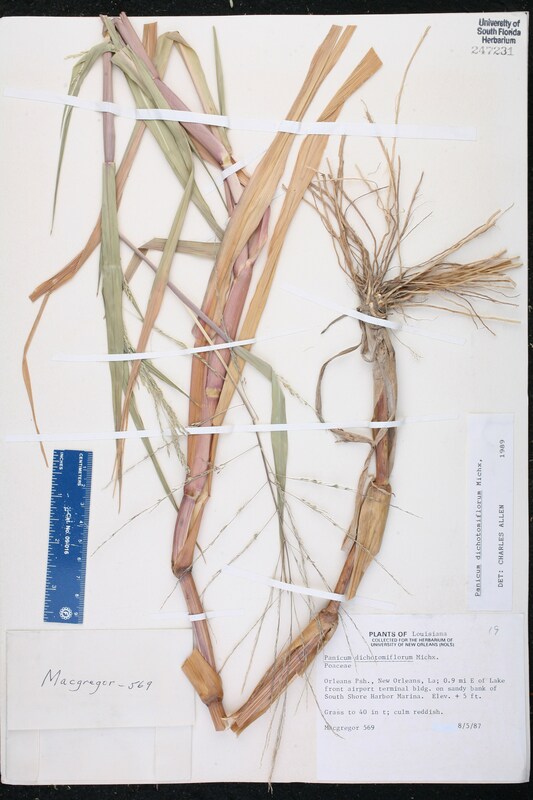 TYPE: MASSACHUSETTS: Barnstable Co.: Half-way Pond, Barnstable, 13 Sep 1919, Fernald 306 (holotype: GH; isotype: US). 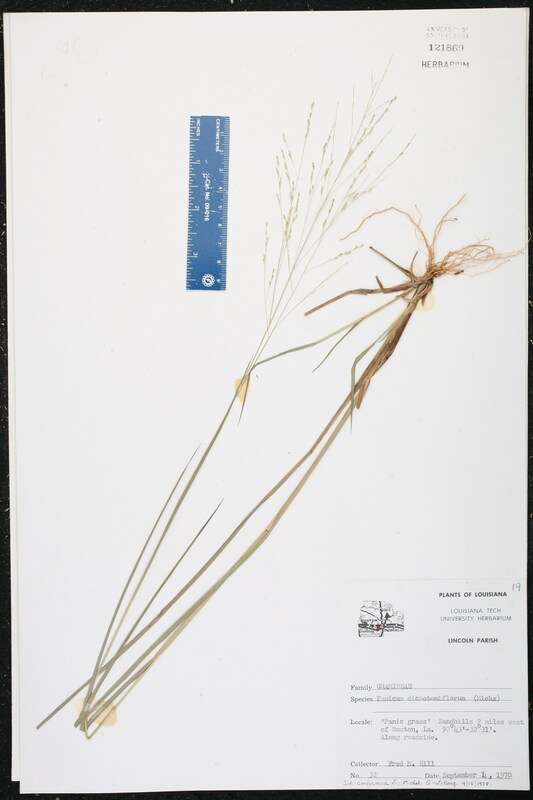 Panicum francavillanum Panicum francavillanum E. Fournier, Mexic. Pl. 2: 25. 1886. 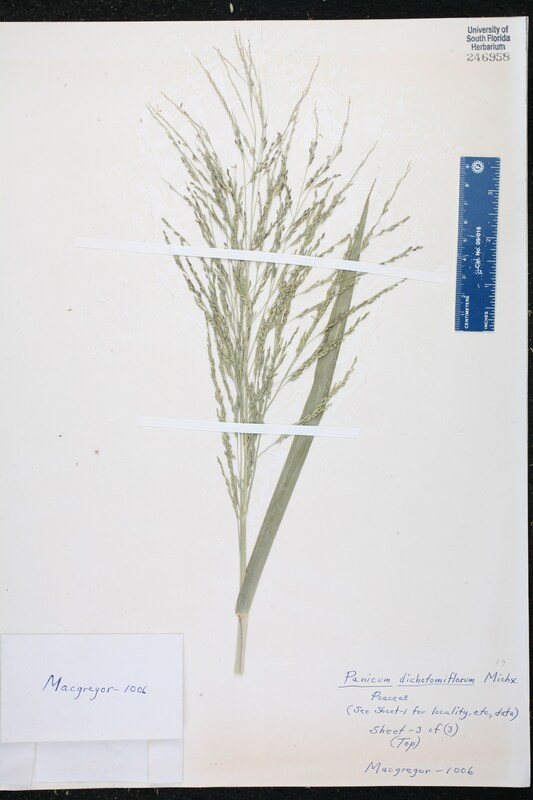 TYPE: MEXICO: "Tacabaya", without data, Schaffner 301 (holotype: P). 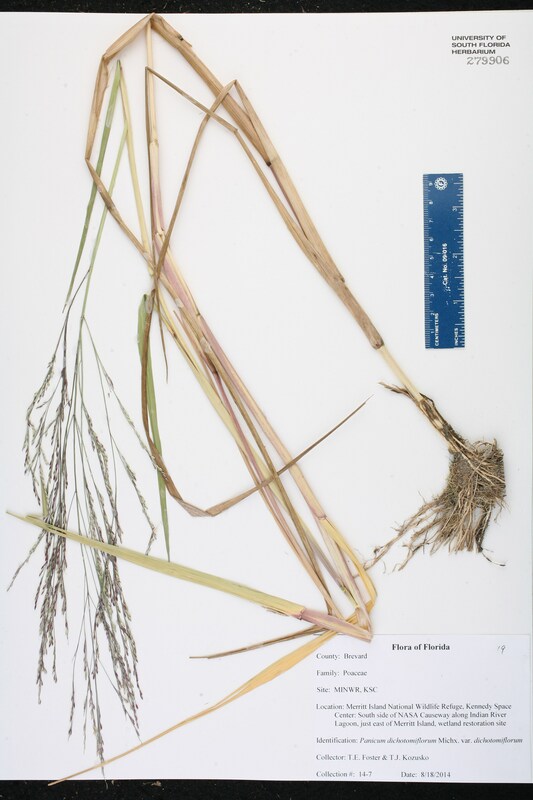 Panicum multiflorum Panicum multiflorum Poiret, in Lamarck, Encycl., Suppl. 4: 282. 1816. 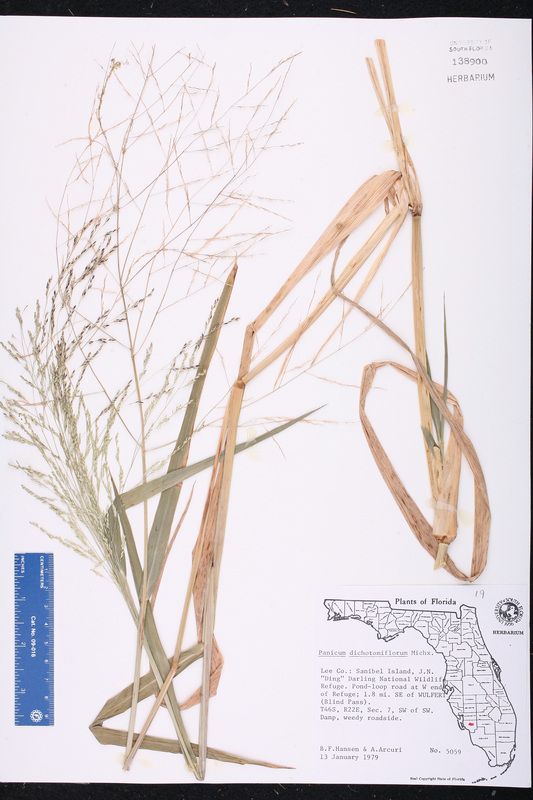 TYPE: SOUTH CAROLINA: Without data, Bosc s.n. 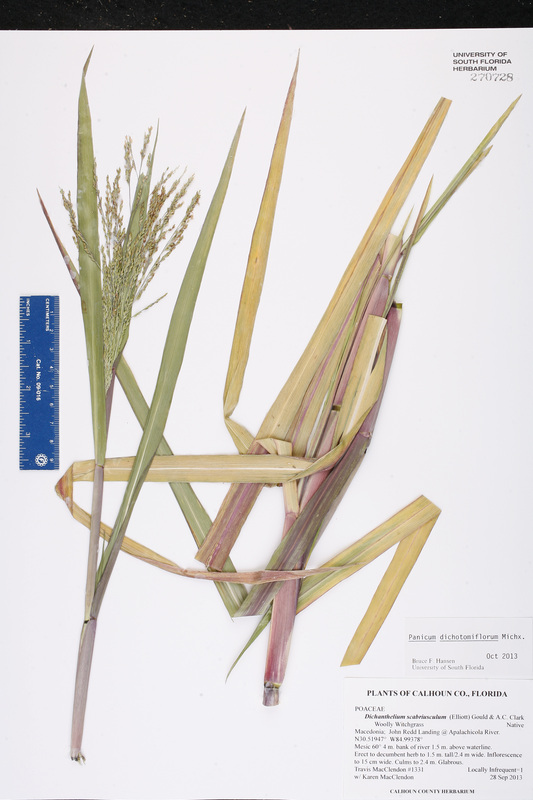 (lectotype: P; isotype: P). Lectotypified by Hitchcock & Chase, Contr. U.S. Natl. Herb. 15: 48. 1910. 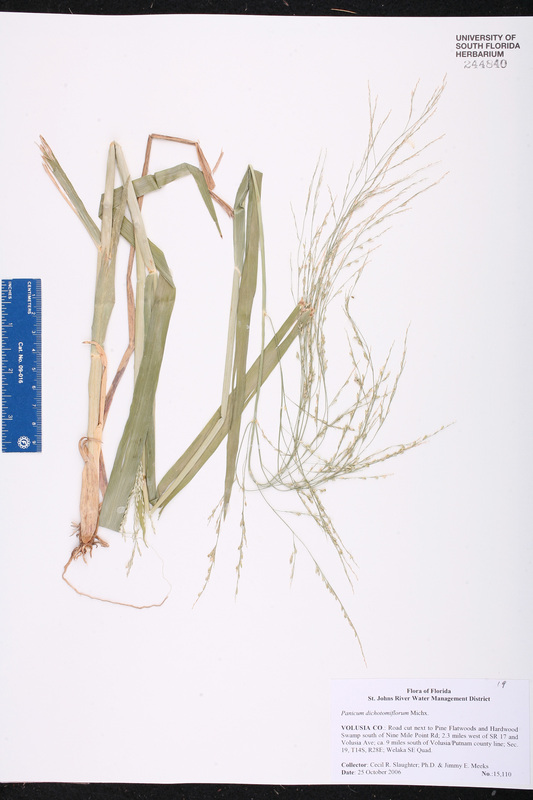 Panicum proliferum Panicum proliferum Lamarck, Tabl. Encycl. 4: 747. 1798. TYPE: VIRGINIA: Cult. 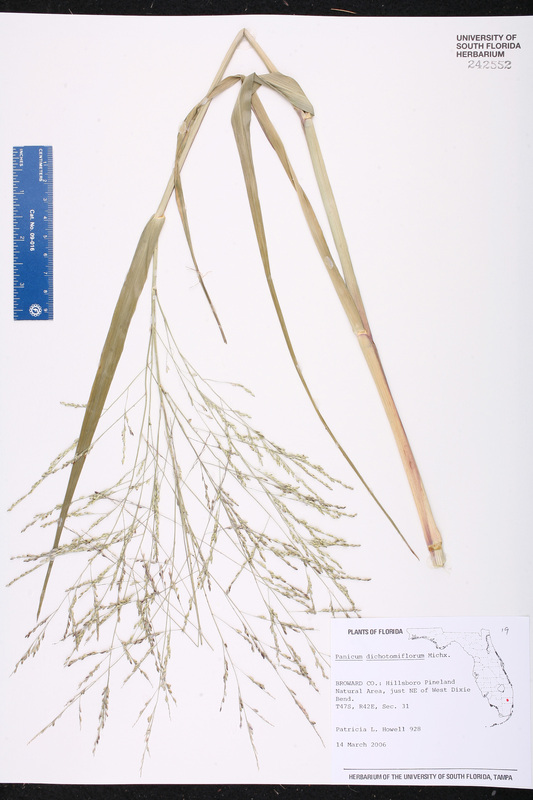 in France, without data (holotype: P; isotype: US(fragm)). 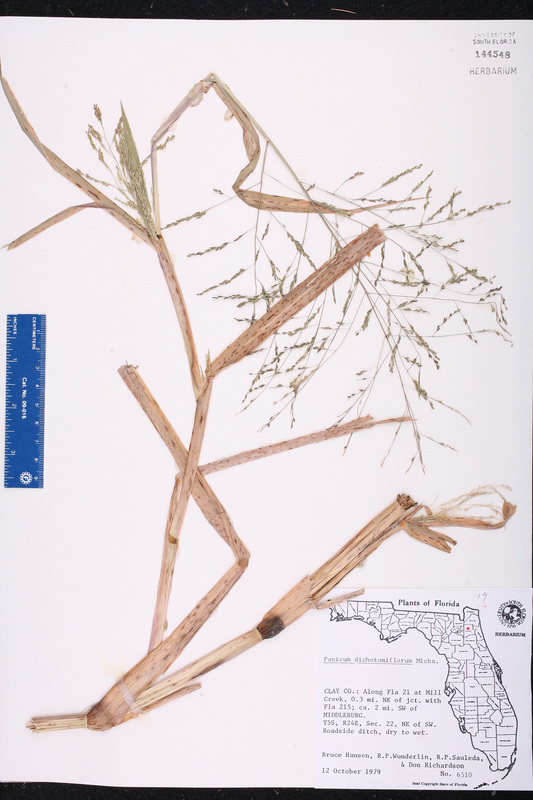 Panicum proliferum var. 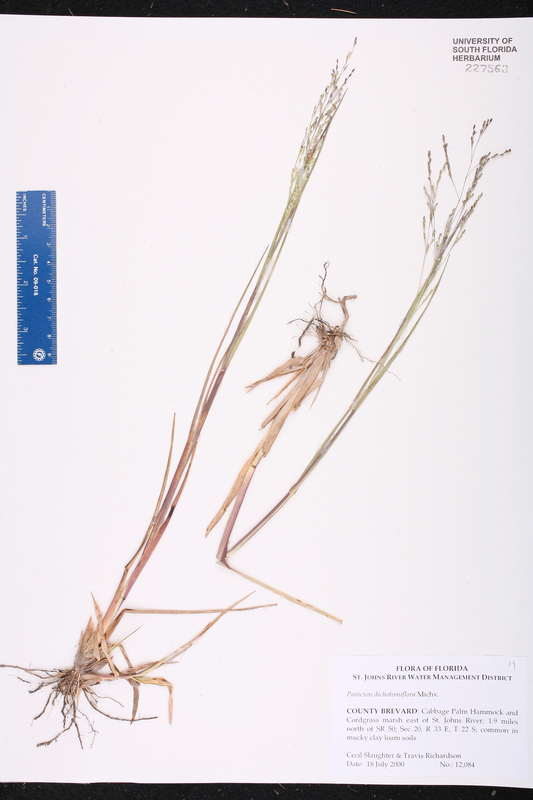 chloroticum Panicum proliferum Lamarck, var. 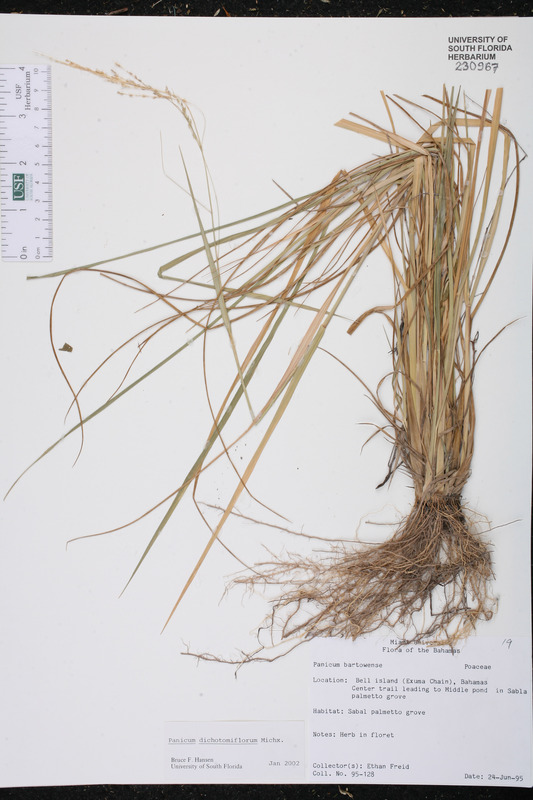 chloroticum (Nees von Esenbeck ex Trinius) Hackel, Repert. Spec. 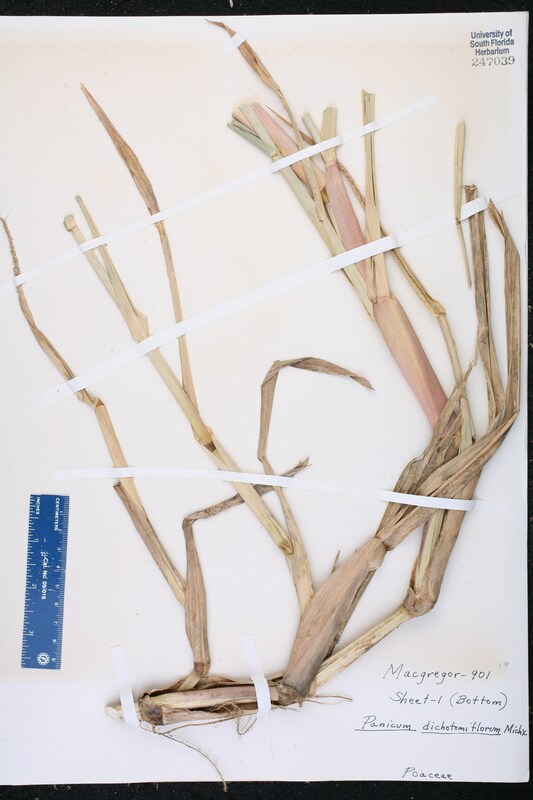 Nov. Regni Veg. 6: 343. 1909. 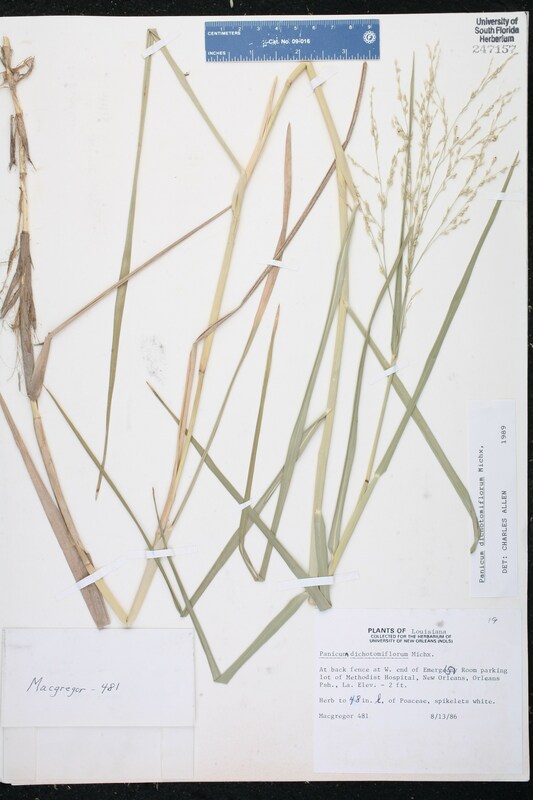 BASIONYM: Panicum chloroticum Nees von Esenbeck ex Trinius 1826. 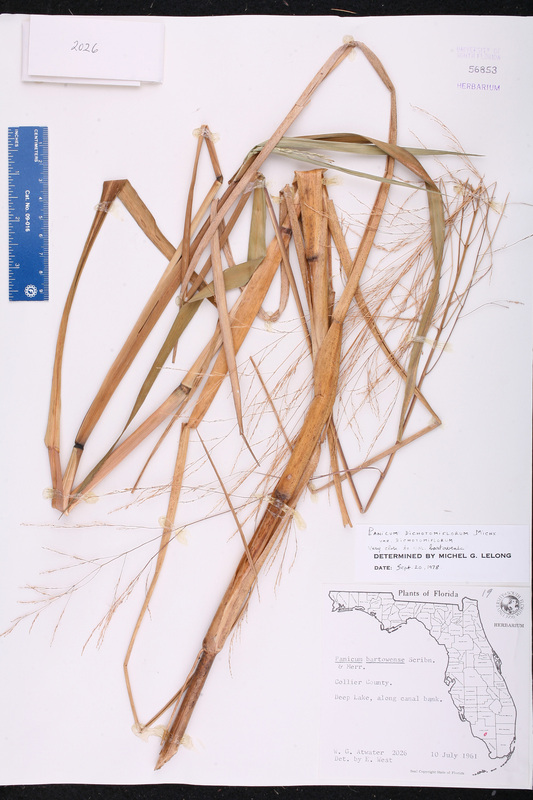 Panicum proliferum var. 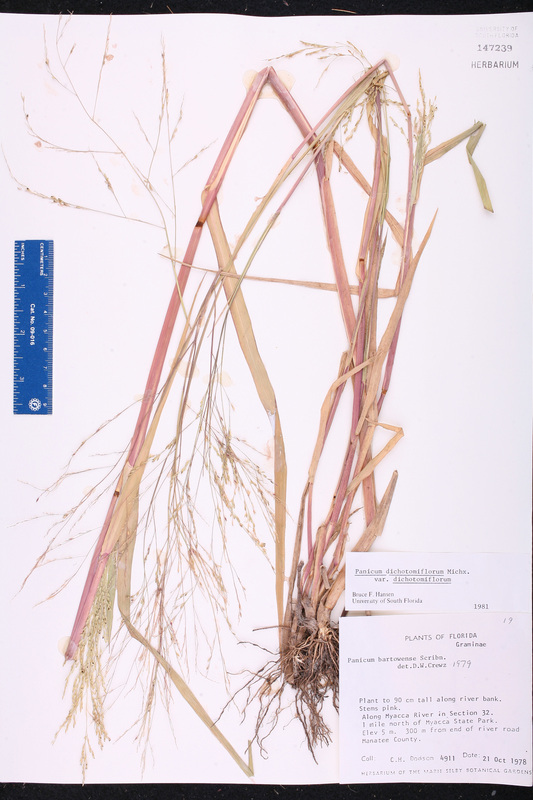 geniculatum Panicum proliferum Lamarck, var. 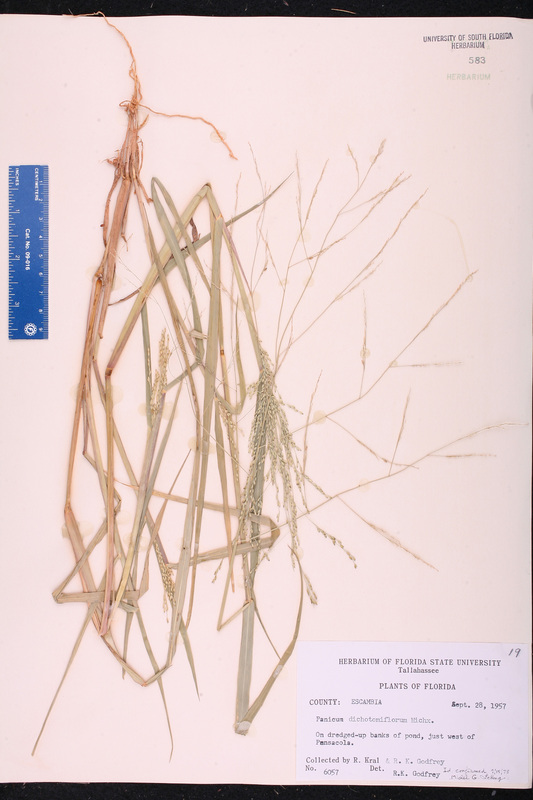 geniculatum A. W. Wood, Amer. Bot. 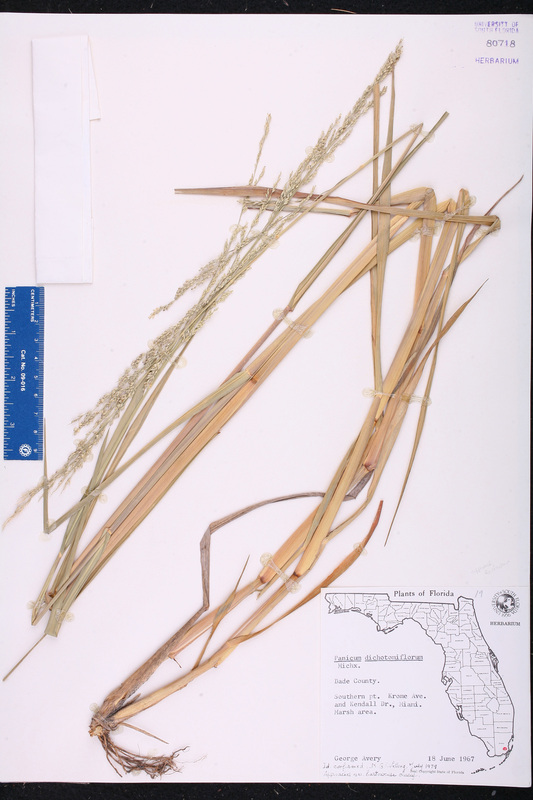 Fl., ed. 2. 392. 1871. 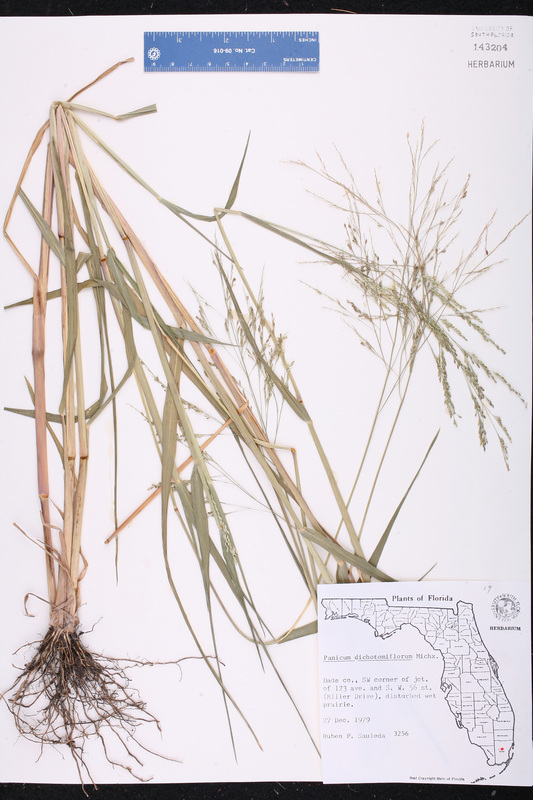 Panicum proliferum var. 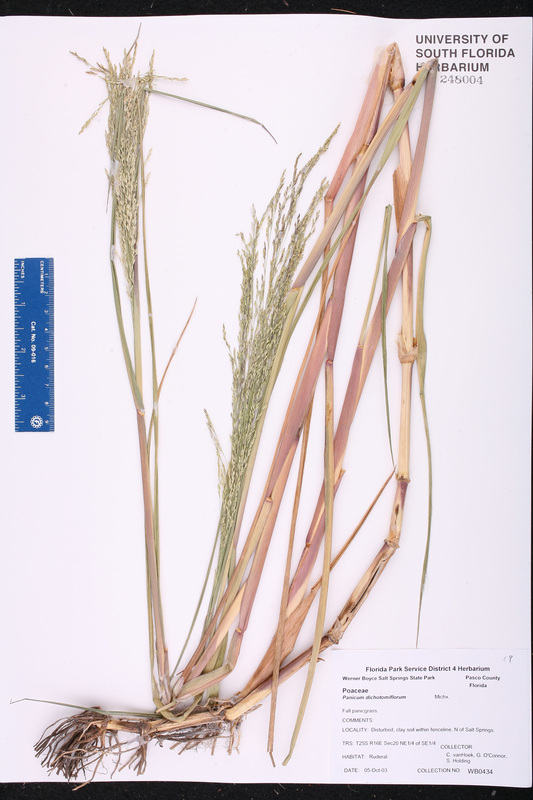 pilosum Panicum proliferum Lamarck, var. pilosum Grisebach, Cat. Pl. Cub. 232. 1866. 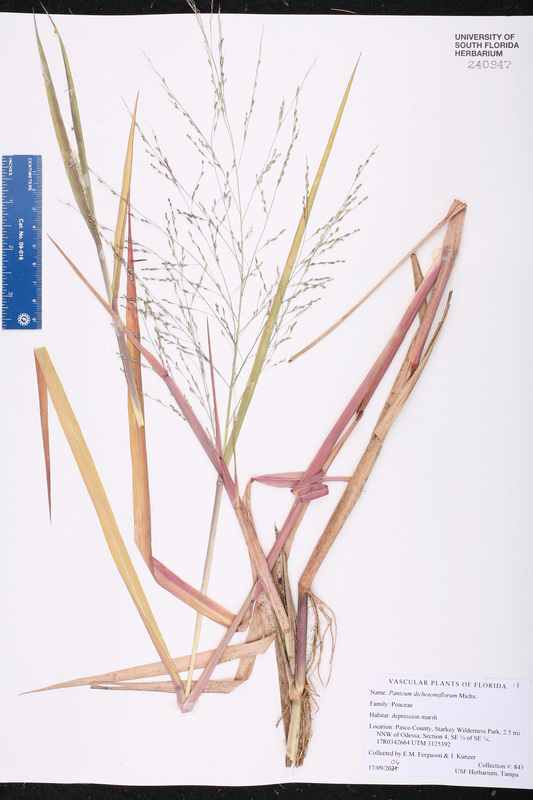 TYPE: CUBA: Hanabana, 1865, Wright 186 (holotype: GOET). 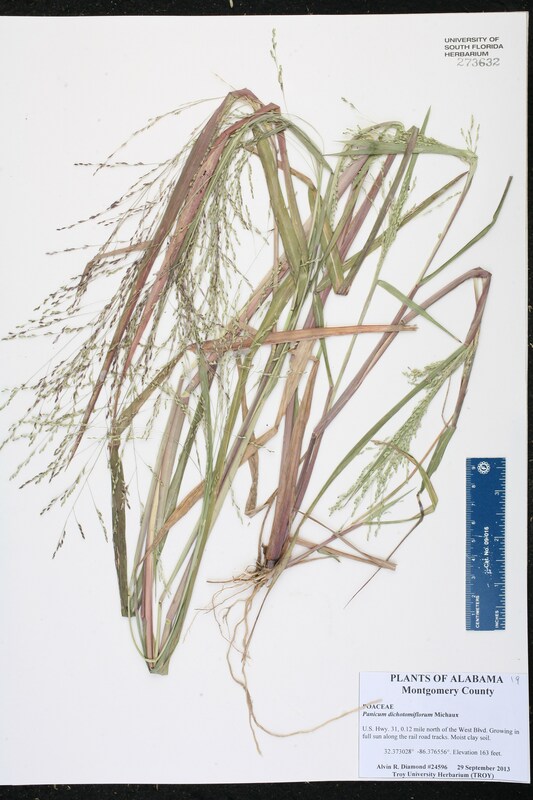 Panicum proliferum var. 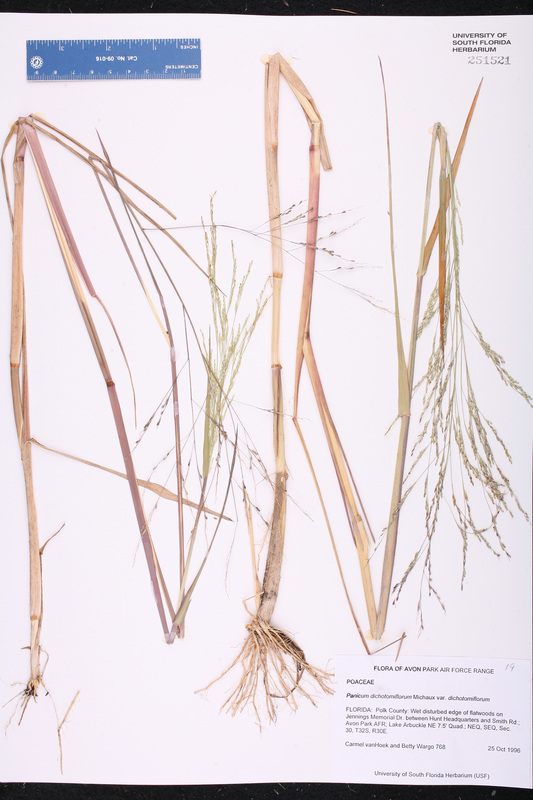 strictum Panicum proliferum Lamarck, var. strictum Grisebach, Cat. Pl. Cub. 232. 1866. 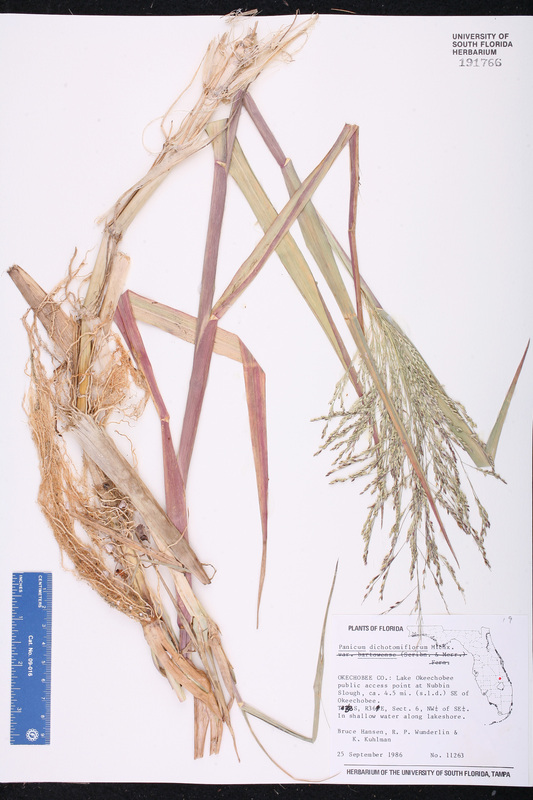 TYPE: CUBA: Without data, Wright 3456 (holotype: GOET). USA Florida Brevard Co. 16 Sep 1973 A.G. Shuey s.n. USA Florida Flagler Co. 24 Oct 1999 W. K. Taylor s.n. 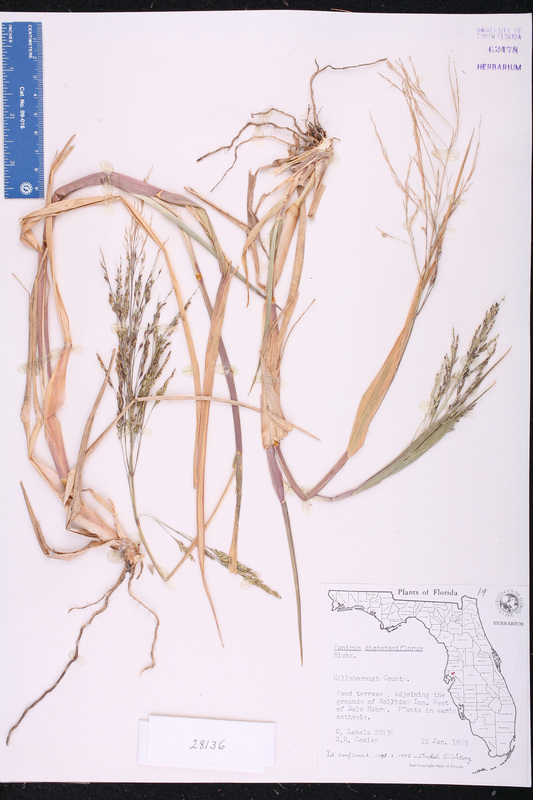 USA Florida Miami-Dade Co. 18 Jun 1967 G. N. Avery s.n. 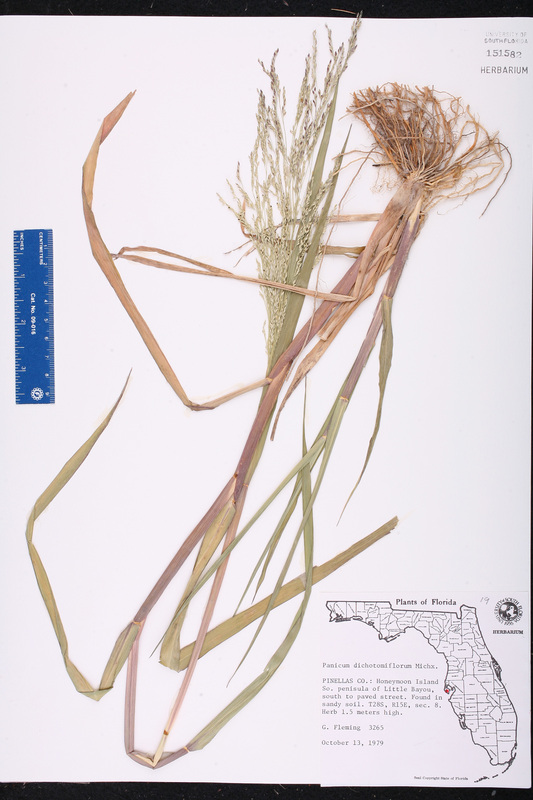 USA Florida Brevard Co. 15 Oct 1992 W. K. Taylor s.n. USA Florida Orange Co. 21 Oct 1992 D. McLean s.n. 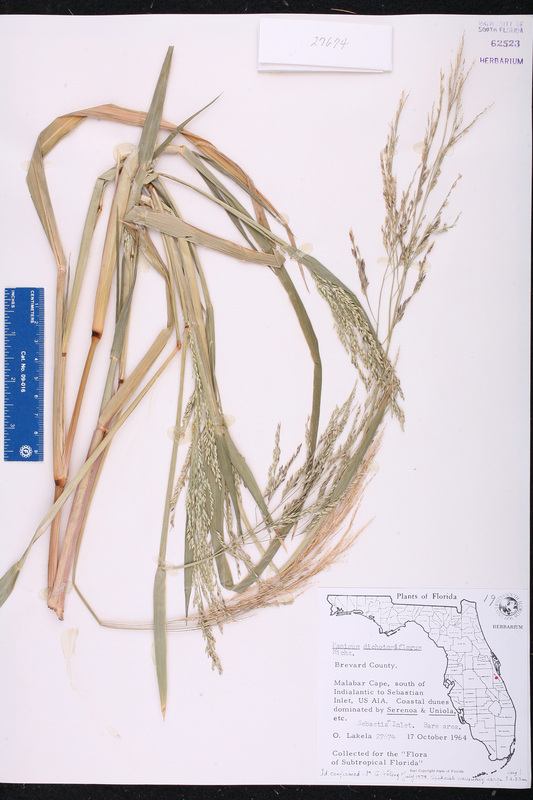 USA Florida Sumter Co. 14 Oct 1984 N. L. Mawhinney s.n. USA Florida Martin Co. Aug 1987 R. O. Woodbury s.n. USA Louisiana Orleans Par. 05 Oct 1990 J. MacGregor 1006 Sheet 1 of 3 - BASE.